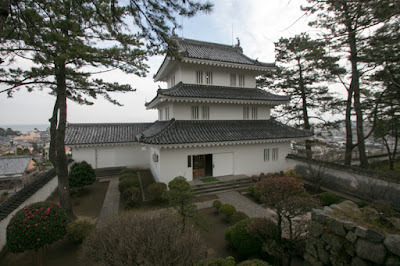 Shimabara castle (島原城) is located at small hill of 30 meter height in the center of Shimabara city, on the eastern slope of Unzen Fugendake mountain in the eastern coast of Shimabara peninsula. 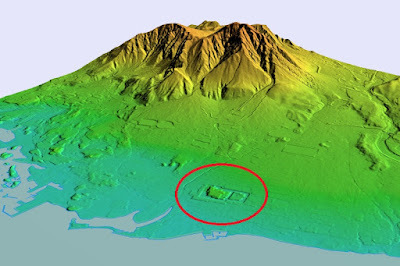 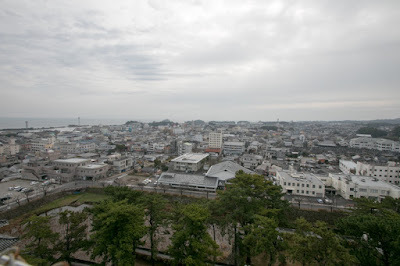 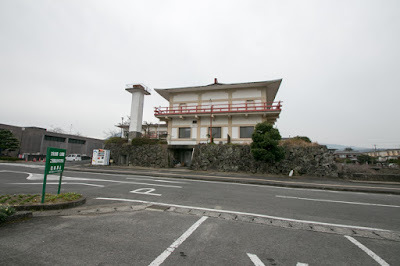 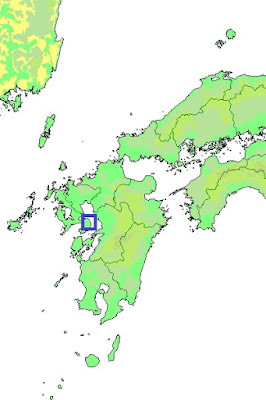 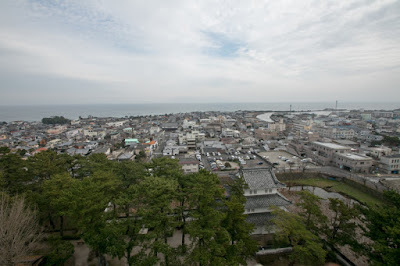 Most part of Shimabara peninsula is covered by eroded slope of Unzan Mountain and not suitable to build a large town. 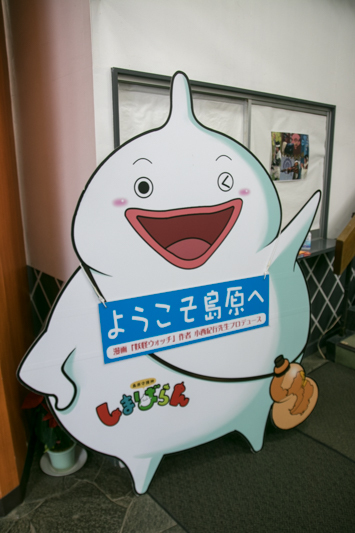 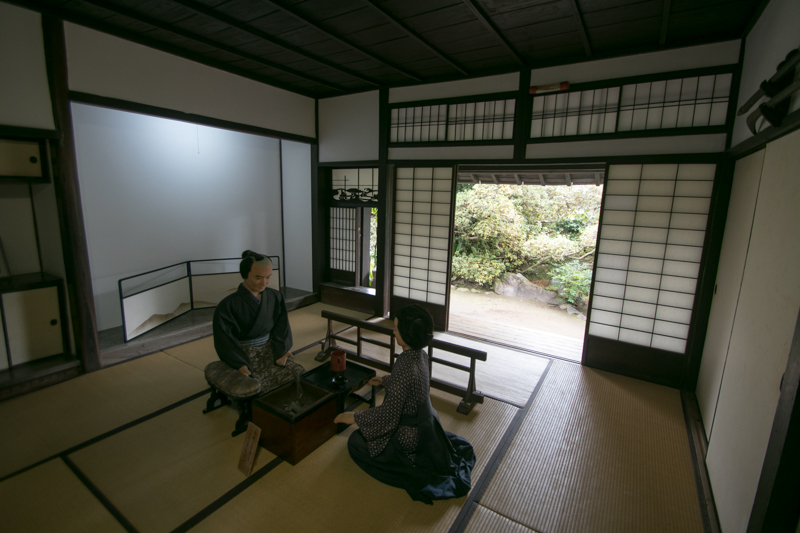 Shimabara area is one of the limited flat area of 3 kilometer long and 1 kilometer wide in the peninsula, and as being placed at its east coast it was convenient place to cross to main body of Kyushu island such as Kumamoto city or Saga city. 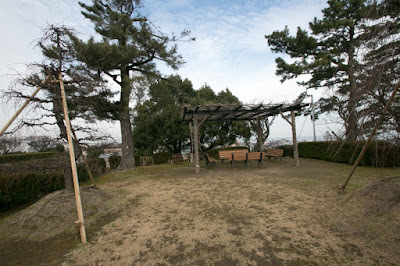 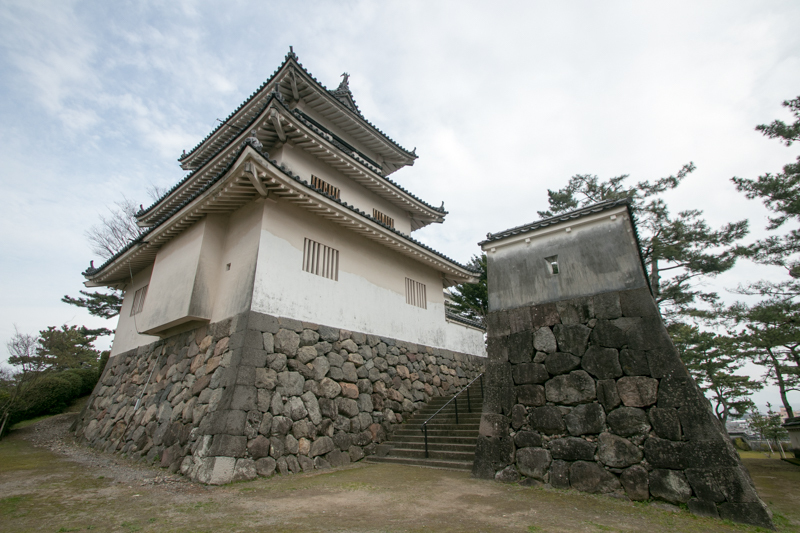 In the medieval era, there was a small castle named Moritake castle at the place of current Shimabara castle. Moritake castle was a branch castle of Arima clan which was the lord of Shimabara peninsula resided at Hinoe castle, and used as a headquarter of ally of Arima and Shimazu army at the battle of Okitanawate against Takanobu Ryuzoji (?-1584) in 1584. 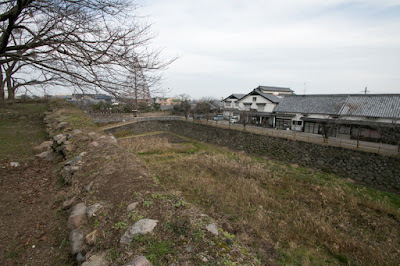 At this battle inferior Arima and Shimazu army built a defense line between Moritake castle and next hill behind marsh, and made side attack to Ryuzoji army marching on the narrow path of march in line and confused them, then finally felled Takanobu Ryuzoji himself in the battle. 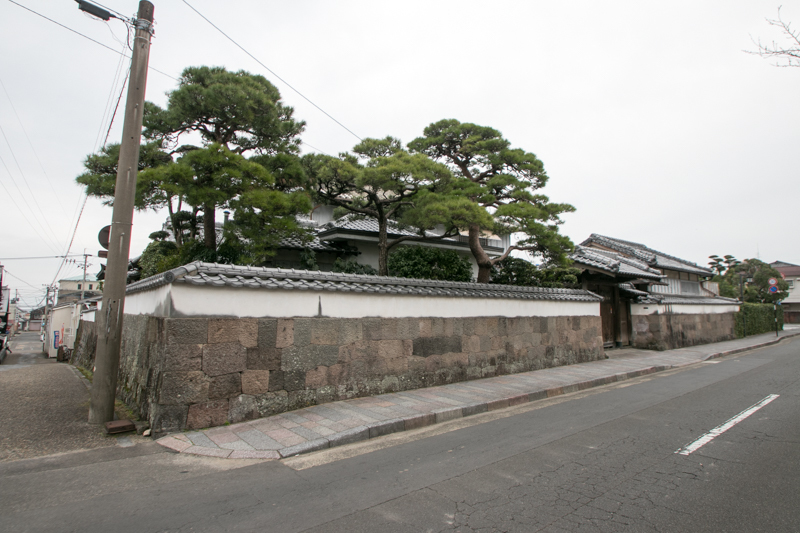 Harunobu Arima (1567-1612), the leader of Arima clan, believe Catholic both for personal relief and gains from foreign trade with Western counties, and became a Christian lord in 1580. 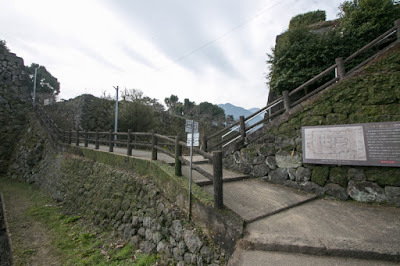 Sumitada Omura (1533-1587), an uncle of Harunobu and lord of Nagasaki peninsula was also Christian, thus south half of current Nagasaki prefecture became the center of Catholic in Japan thus Churches or colleges were built in this area. 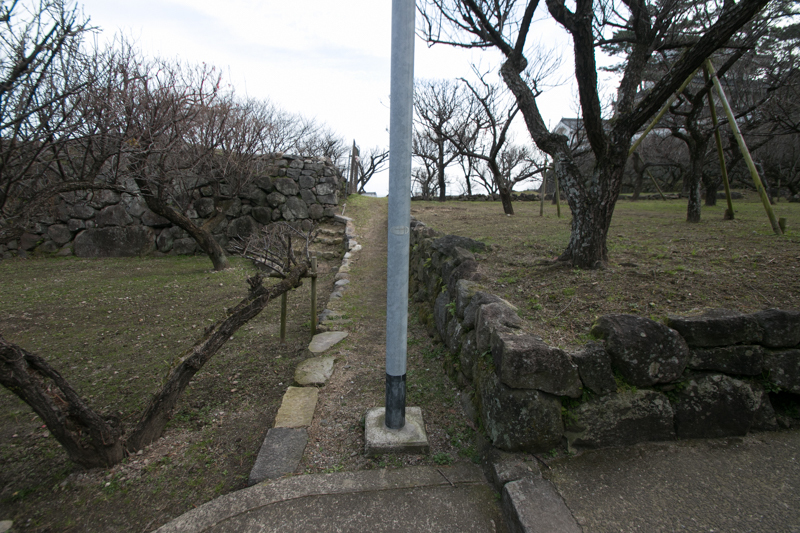 But in 1587, Hideyoshi Toyotomi (1537-1598) who mostly united Japan banned Christianity. In Japan, Catholic made rapid growth by effort of enthusiastic missionaries without coordination with political power and it seemed uncontrorable for authority. 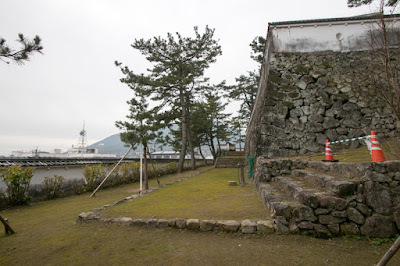 Also Sumitada Omura donated Nagasaki port to church by pure intention or protection of the port, but this seemed break of unite and history of Japan and reminded the risk of colonization by foreign country. Also Christian lords in Kyushu region did not coexist with traditional religion and brought social disorder. 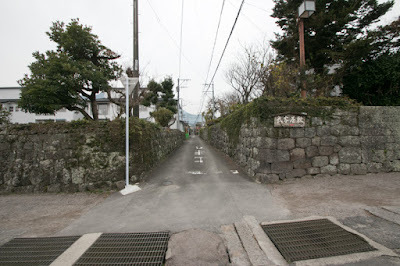 But banning at this time was nominal one and personal belief was still connived. After the death of Hideyoshi, Arima clan supported Ieyasu Tokugawa (1543-1616) at the battle of Sekigahara and was admitted as a feudal lord under Edo Shogunate. But Edo Shogunate intended to grasp foreign trade by themselves under alliance with Protestant nations, and did not allow private trade of Christian lords with foreign counties any more. 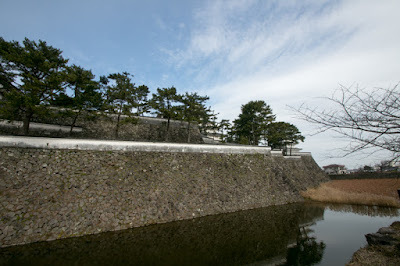 Among such situation, in 1612, Harunobu was forced to suicide as he sent bribe to the staff of Shogunate to recover former territory deprived by Ryuzoji clan. 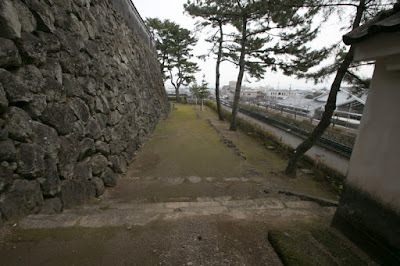 His son Naozumi Arima (1586-1641) succeeded the territory, but Naozumi turned to suppress the Christian in his territory. 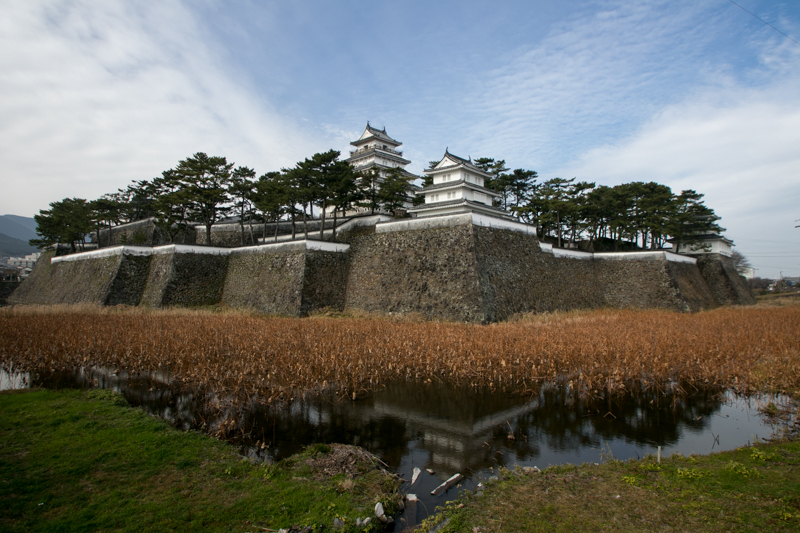 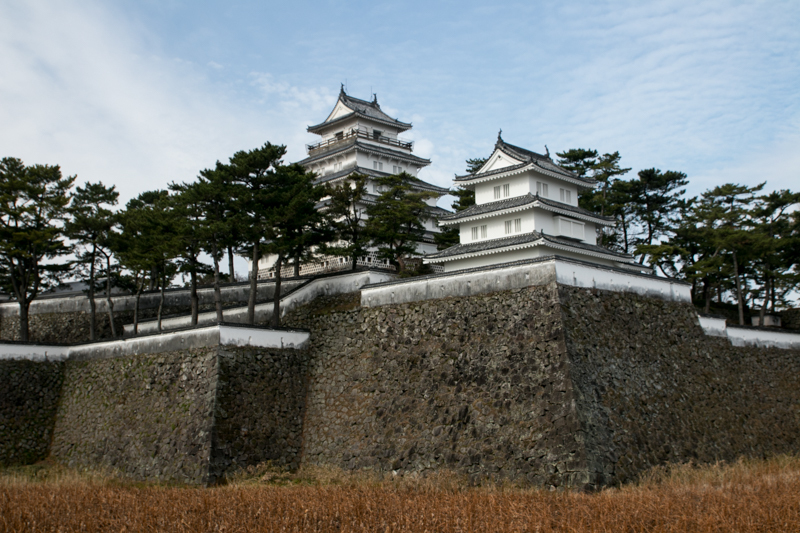 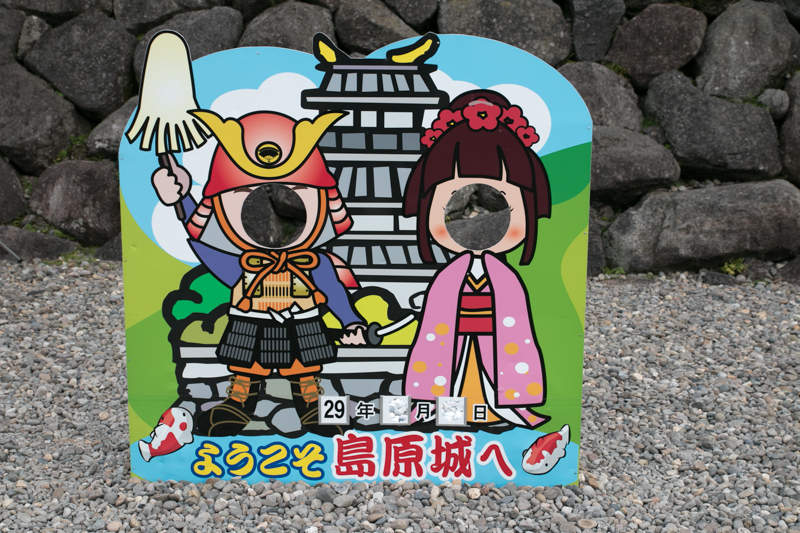 In 1614, Naozumi moved to Nobeoka castle (Miyazaki prefecture) and Shimabara peninsula was once directly held by Shogunate. 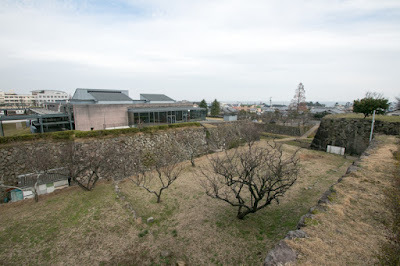 But in 1616, as a reward for activation at the battle of Osaka castle, Shigemasa Matsukura (1574-1630) was appointed as a lord of Shimabara peninsula. Based on “Ikkoku Ichijyo Rei” (one domain one castle rule), Shigemasa abolished Hinoe castle and Hara castle used by Arima clan and newly built Shimabara castle at the place of former Motirake castle. 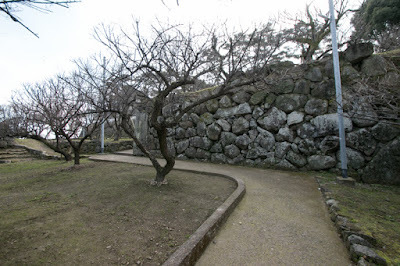 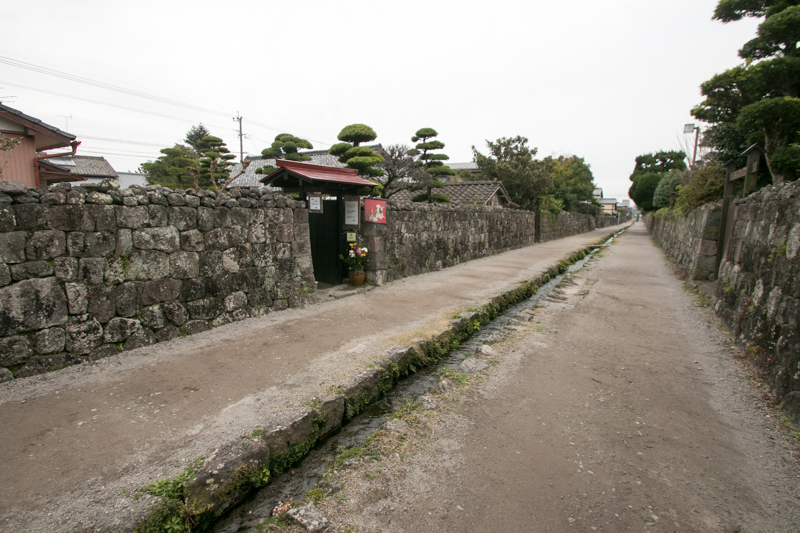 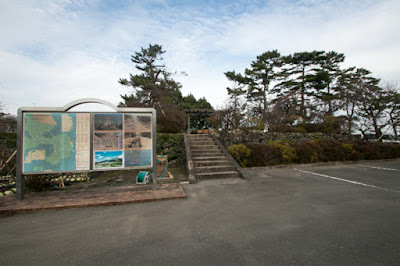 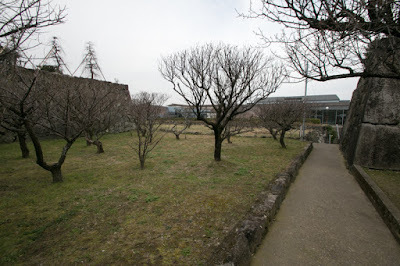 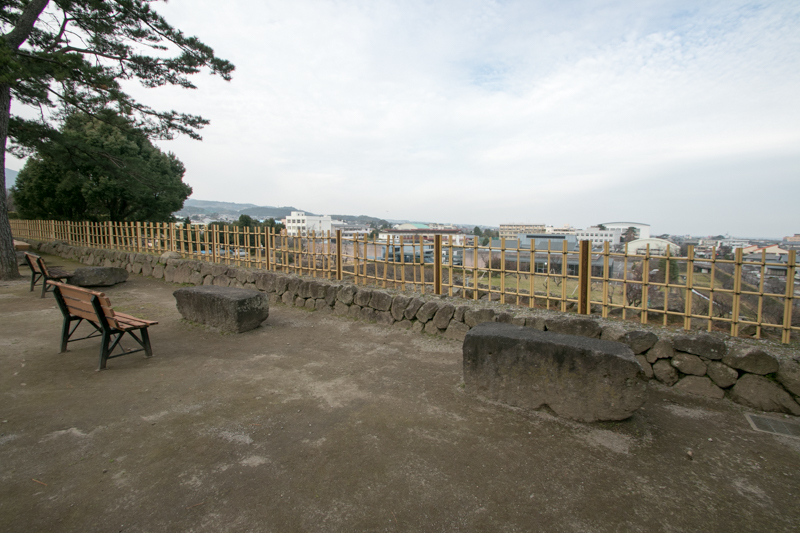 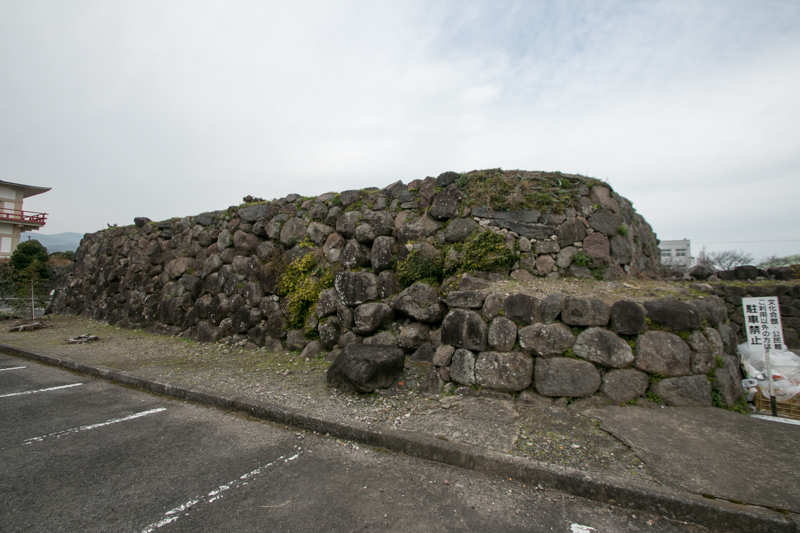 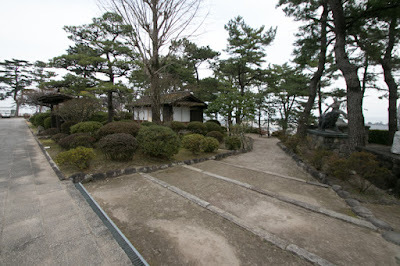 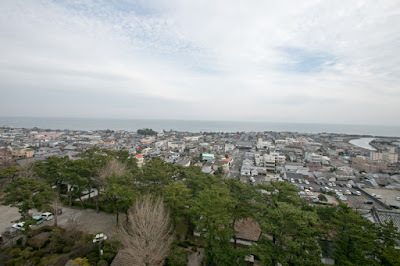 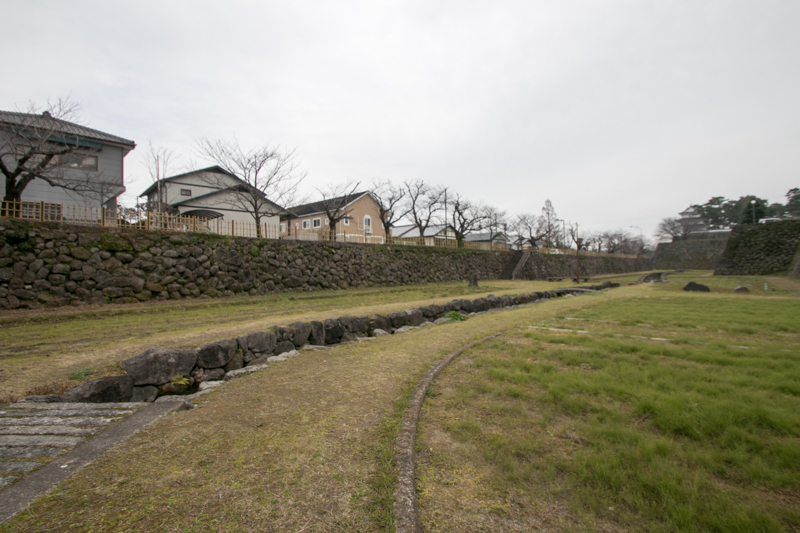 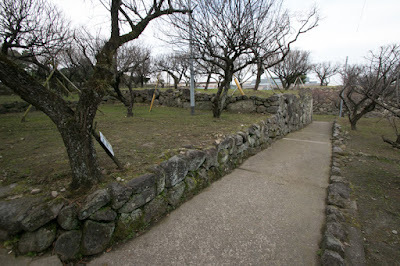 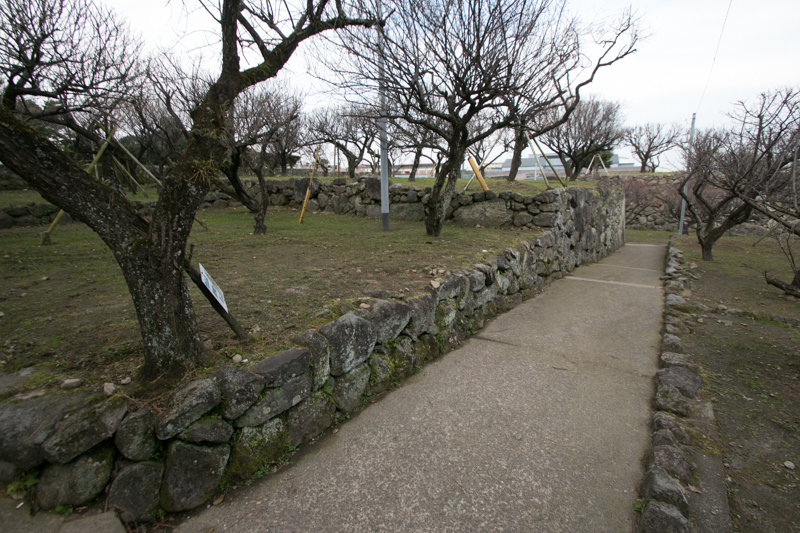 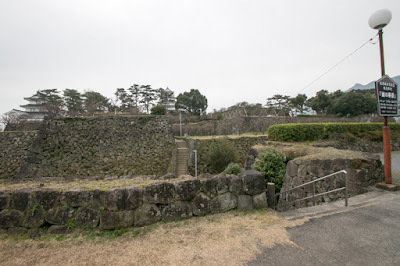 Shigemasa avoided Hinoe castle which was the semi-dependent Christian area and opened to outer sea, and chose Shimabara area which was closer to main body of Kyushu island. Shigemasa was a son of Shigenobu Matsukura (1538-1593), an important retainer of Tsutsui clan which was the lord of Yamato province (Nara prefecure), and compared with Kiyooki Shima (?-1600?) known as his middle name Sakon) who later became the confident general of Mitsunari Ishida (1560-1600). 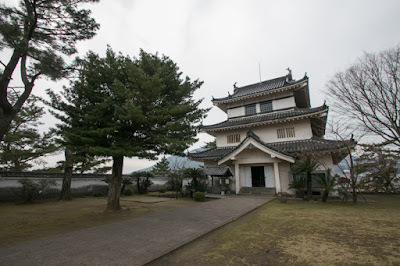 After the transfer of Tsutsui clan to Iga province (western part of Mie prefecture), Matsukura clan stayed at Yamato province as small magistrate and promoted into feudal lord this time. 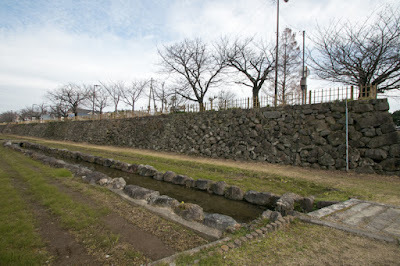 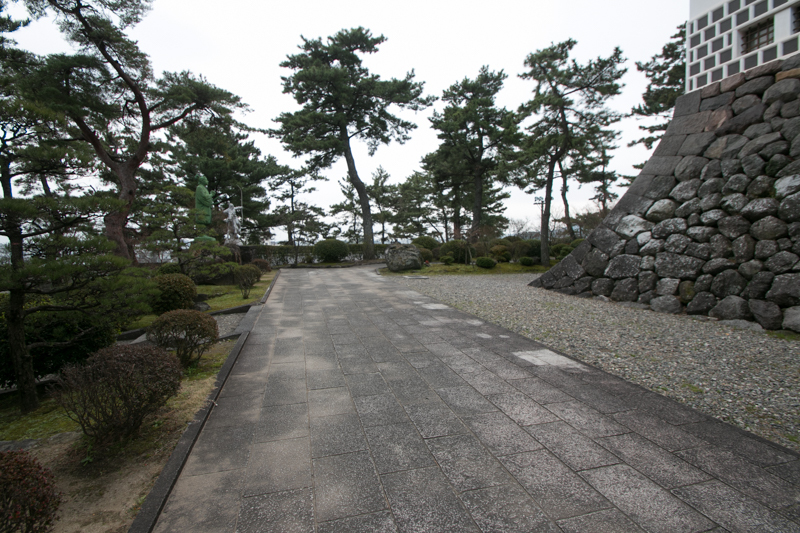 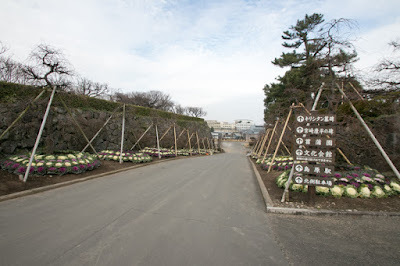 His former nation Yamato province was a rich province with cumulative commerce and also good rice harvest. 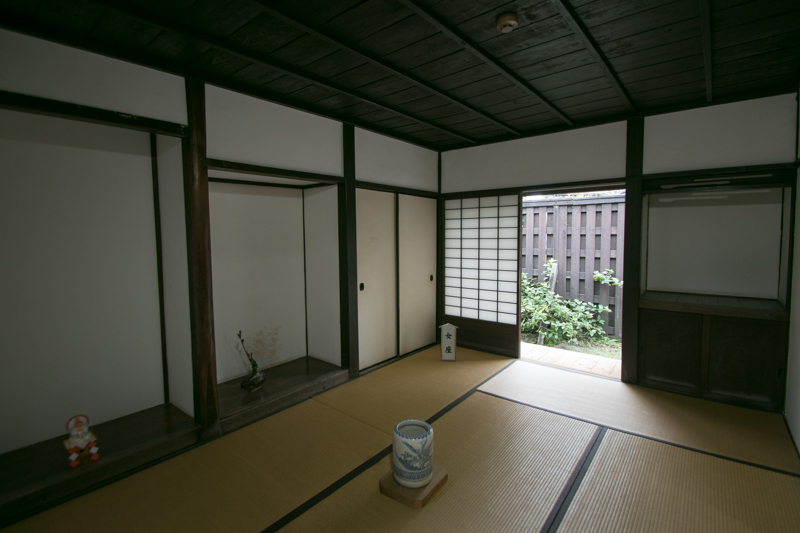 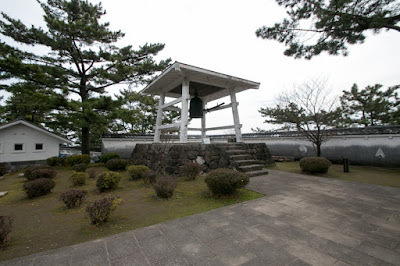 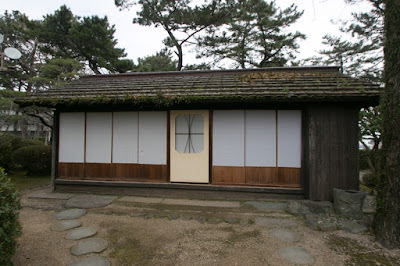 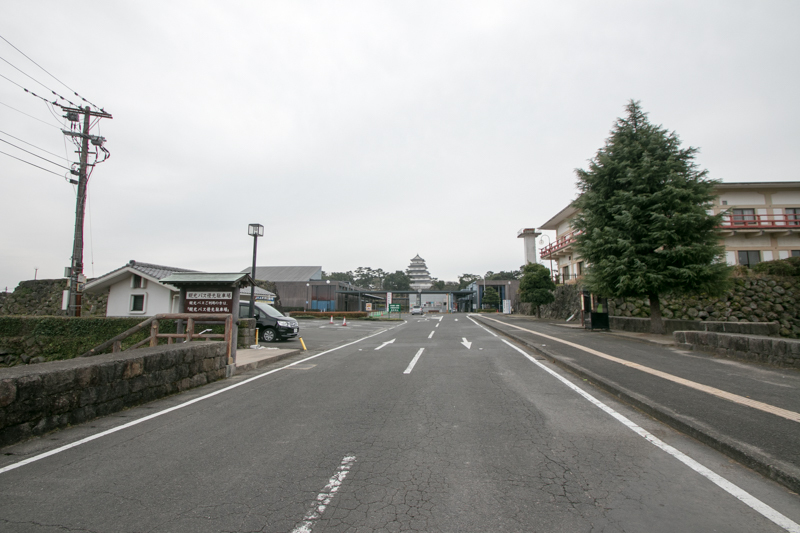 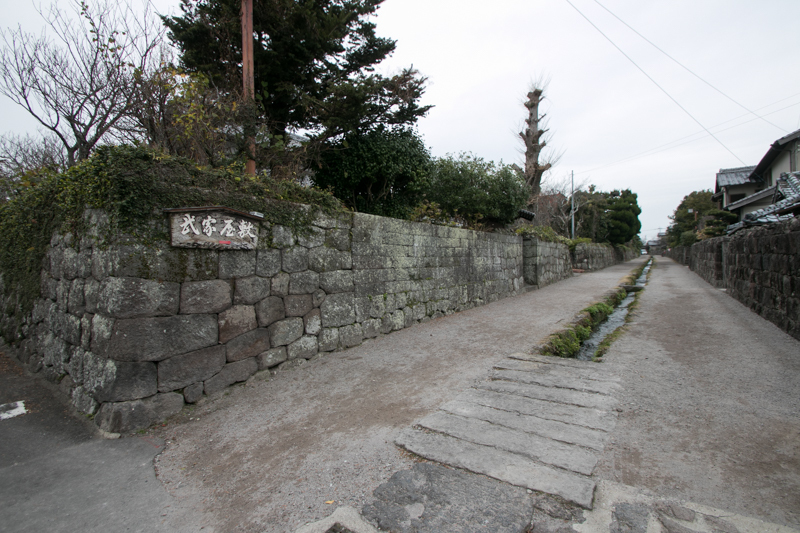 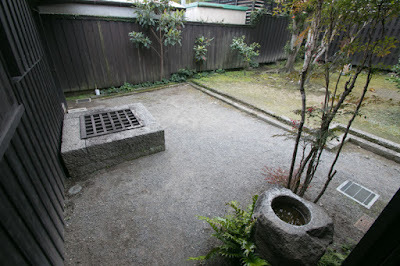 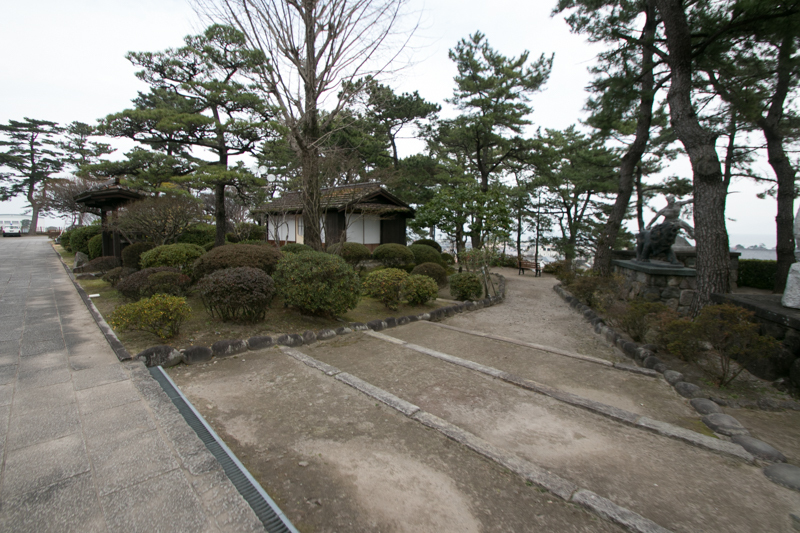 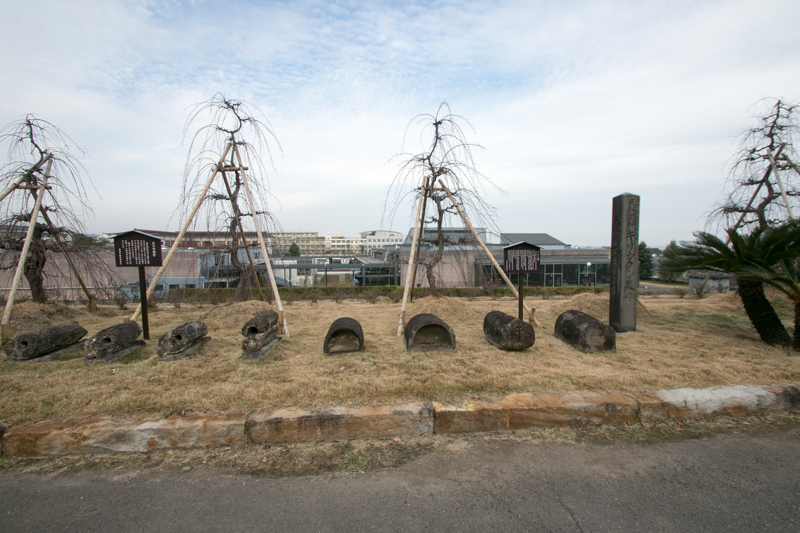 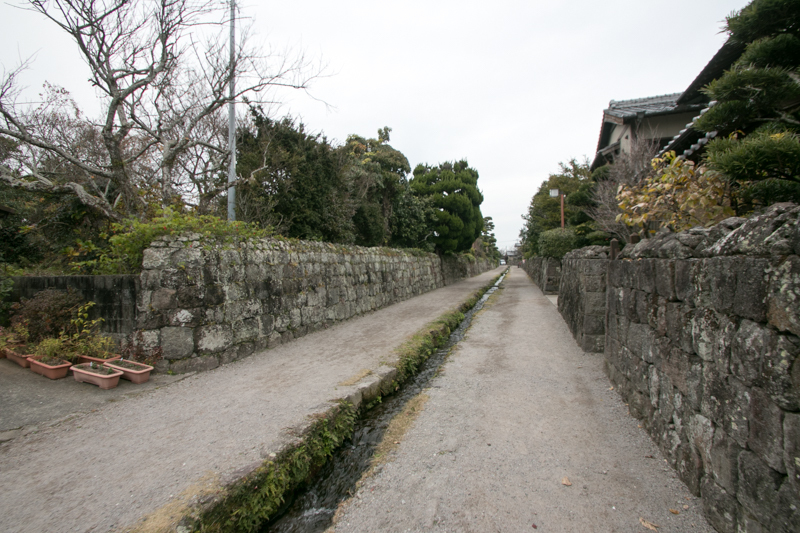 Different from Shimaba area, Shigemasa was respected in Yamato province for development of industry and commerce. But Shimabara peninsula was vast but mostly the slope of Unzen mountsins not suitable for cultivation, and foreign trade maintained the prosperity of this area was already banned. 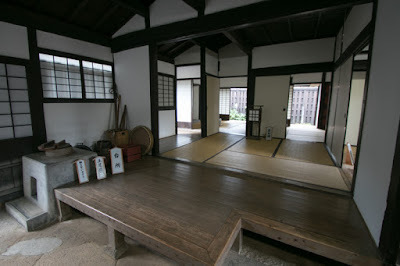 Shigemasa might be given troublesome role in exchange of promotion by Shogunate. 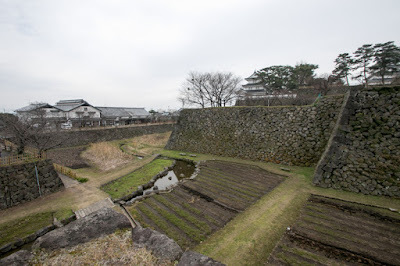 Upon the arrival of peace period after the battle of Osaka and there was no chance to make achievement in battle, thus Shigemasa showed his loyalty by bearing excessibve work at constructions ordered by Shogunate. 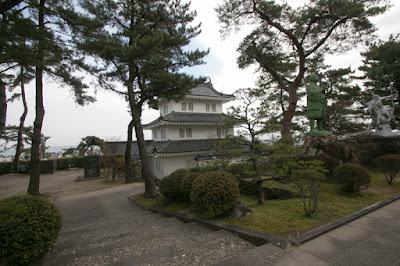 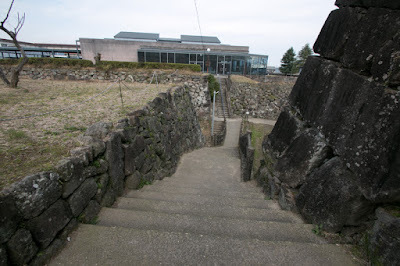 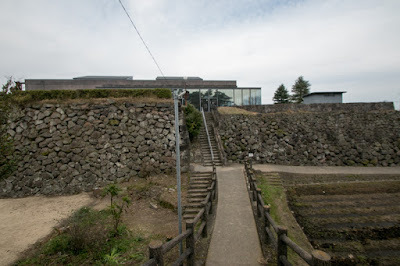 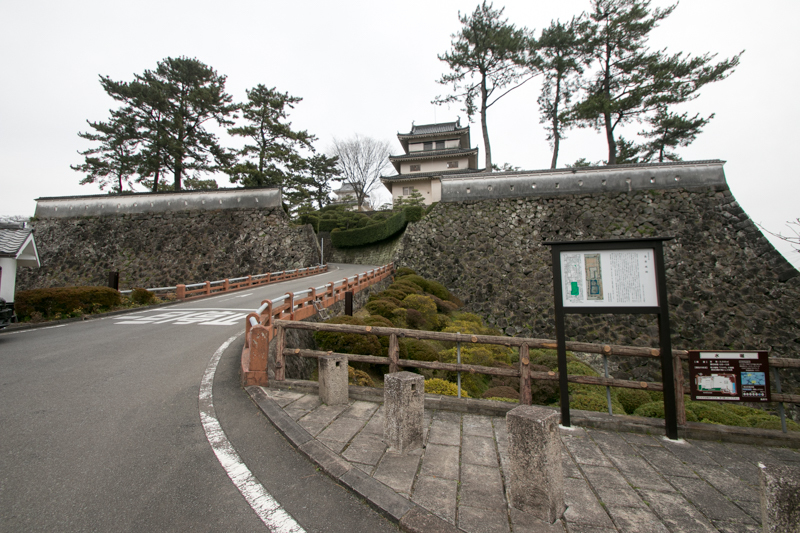 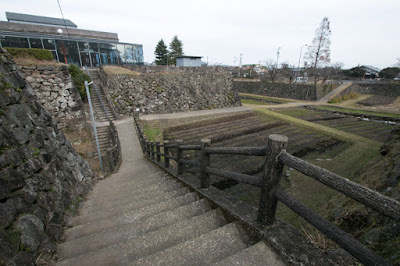 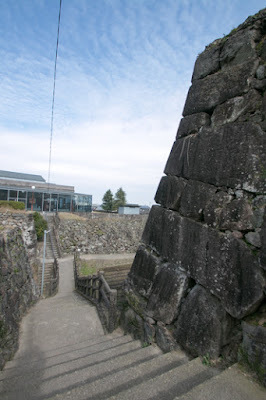 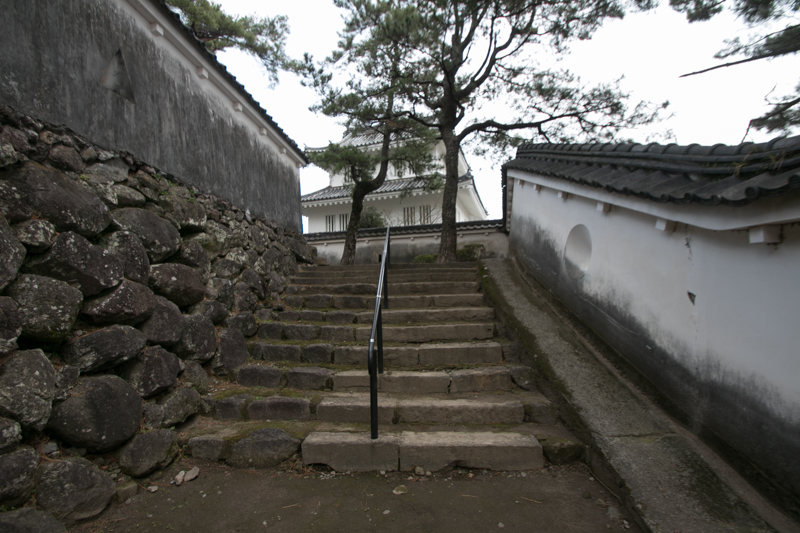 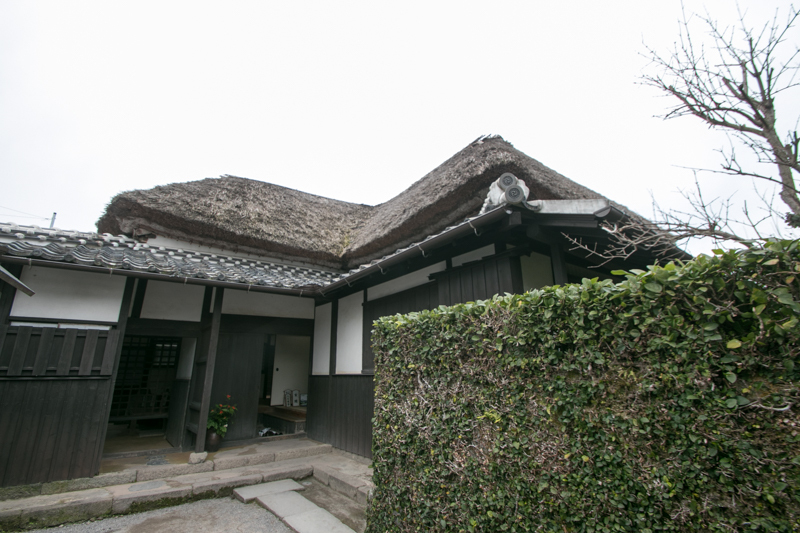 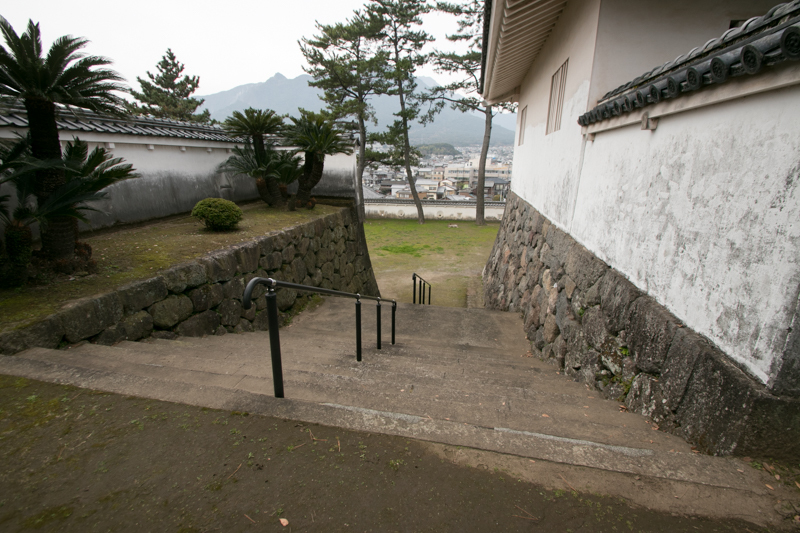 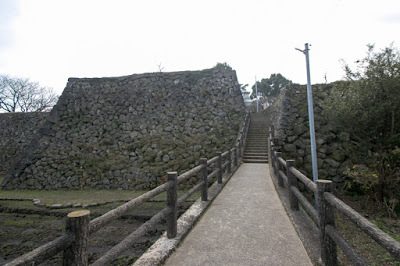 Furthermore, seeing the unstable situation of his territory after banning of Christianity, Shigemasa needed secure castle expecting rebellion of local people. 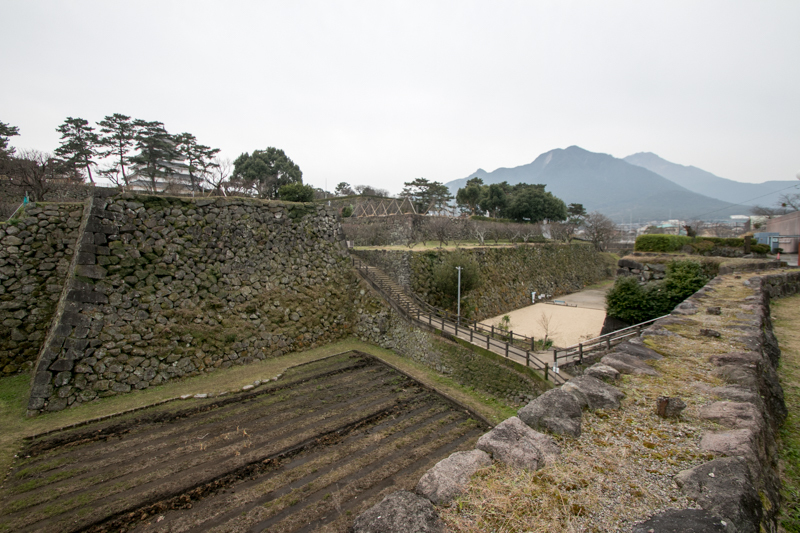 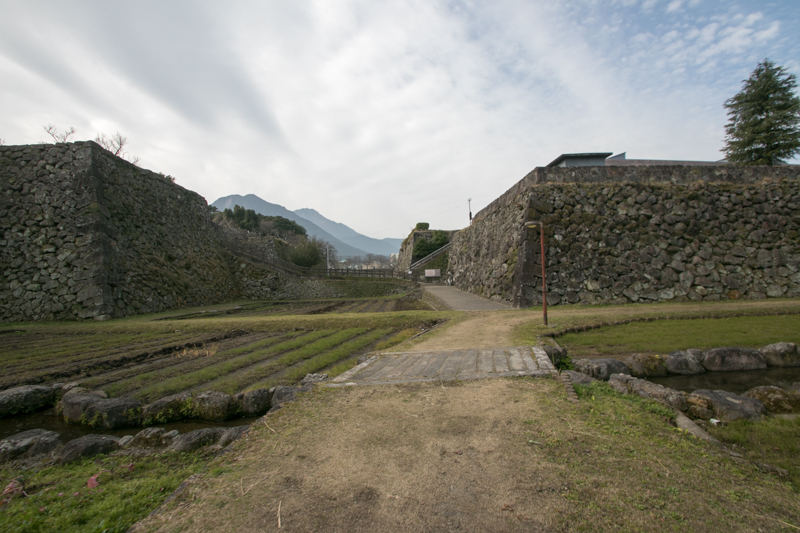 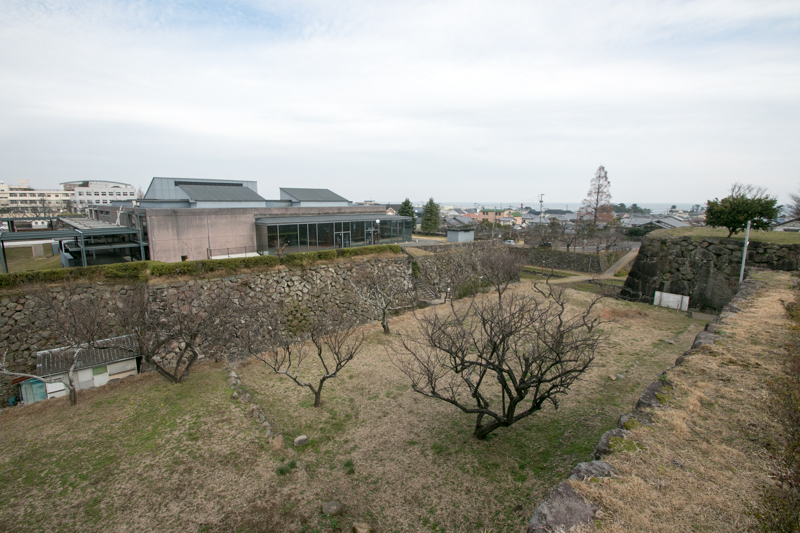 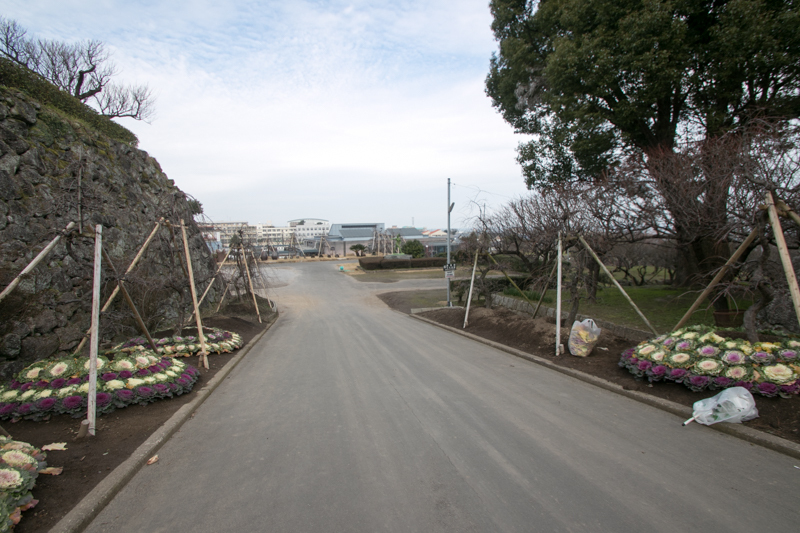 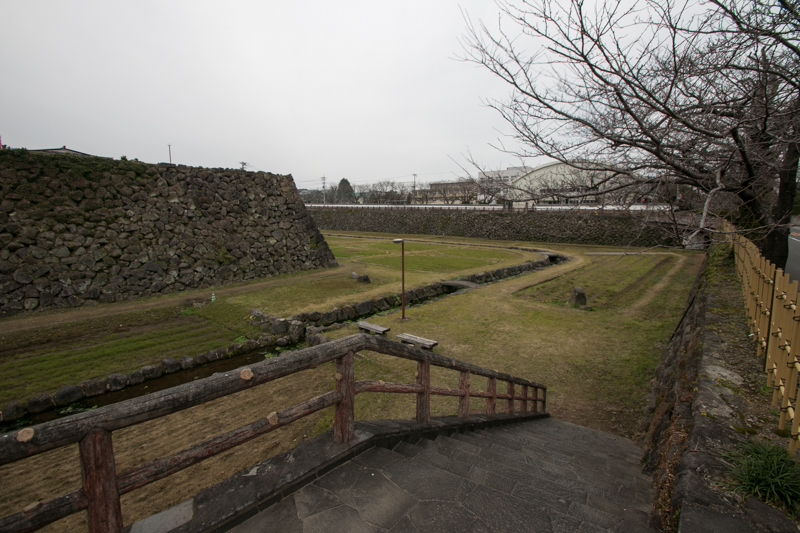 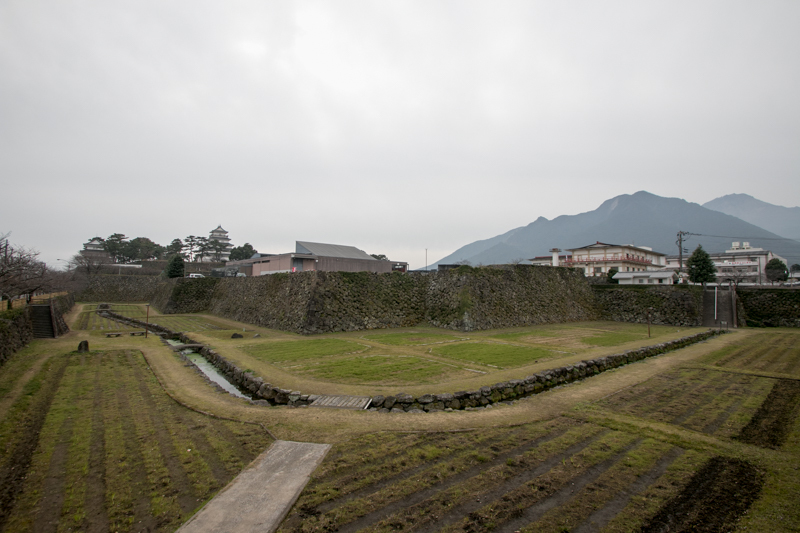 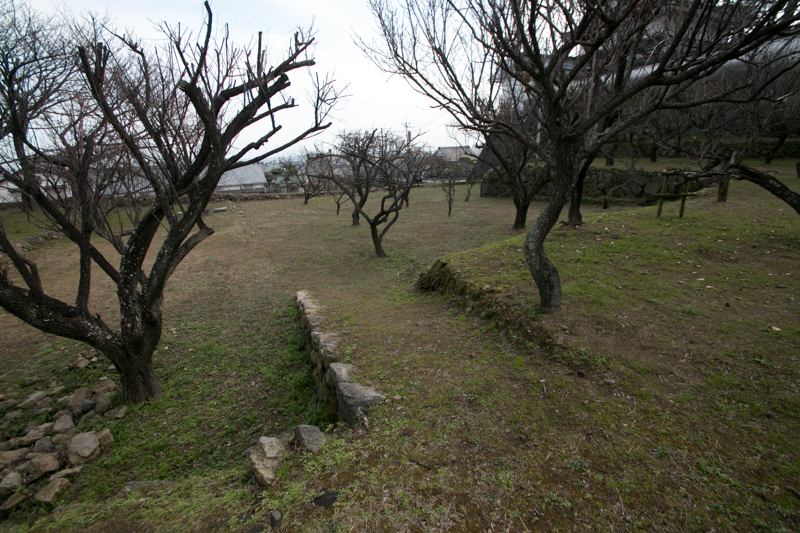 Construction of castle had started in 1618, and after several year construction Shimabara castle completed by 1625. 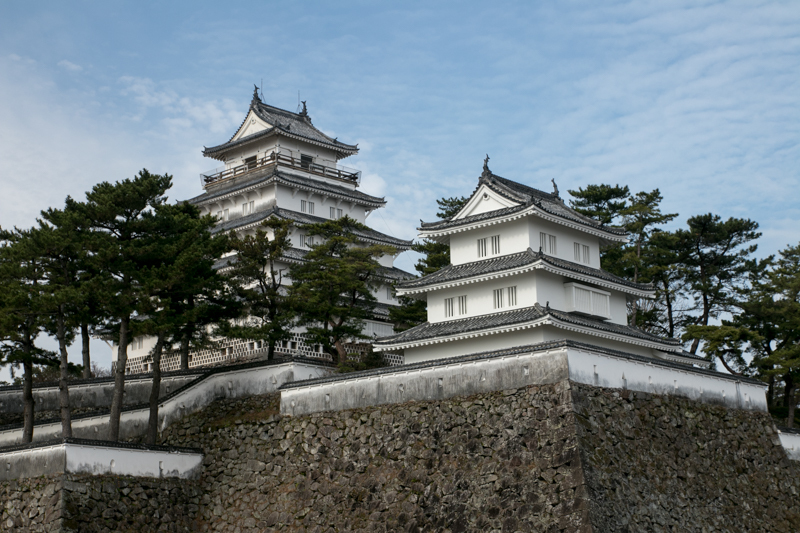 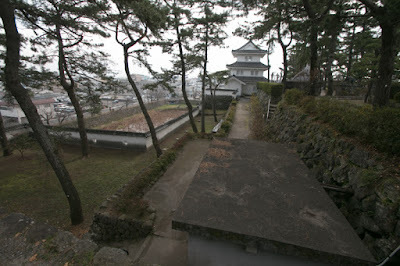 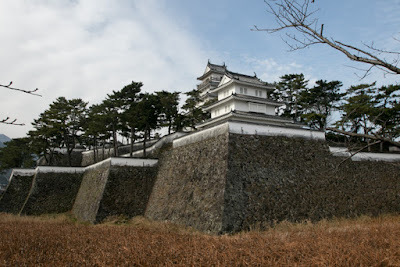 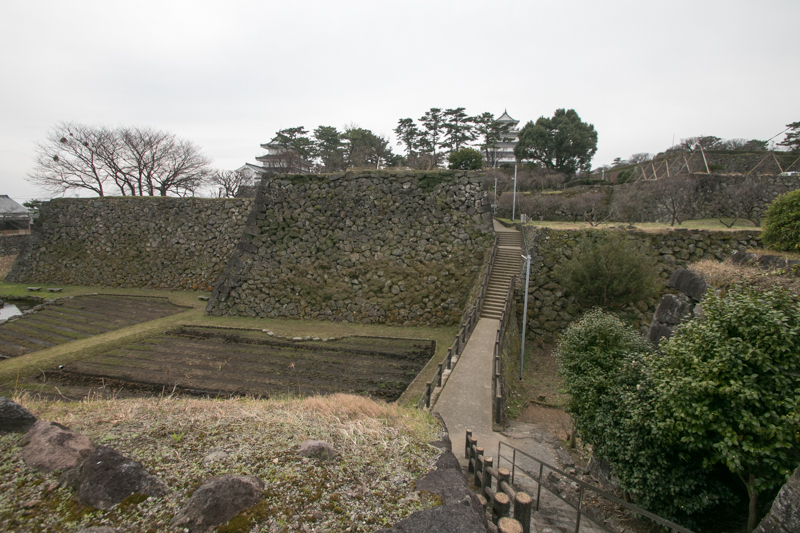 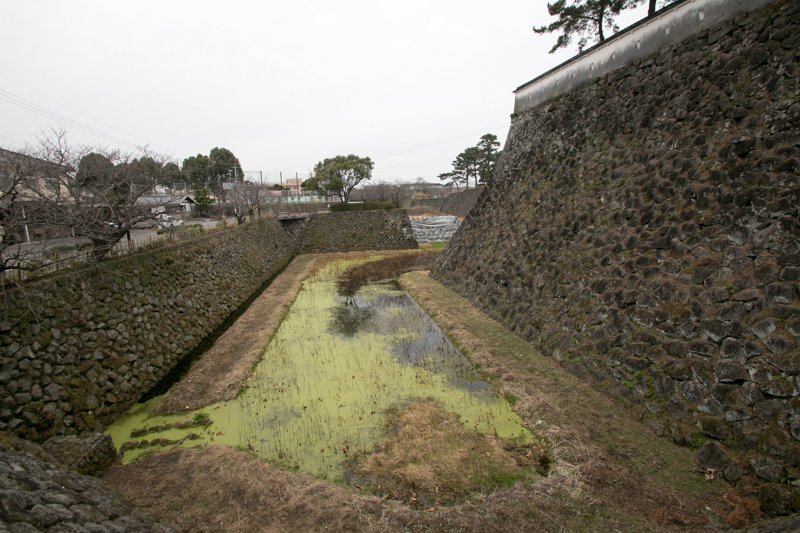 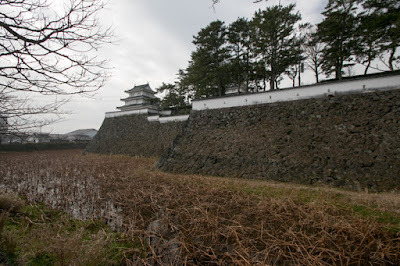 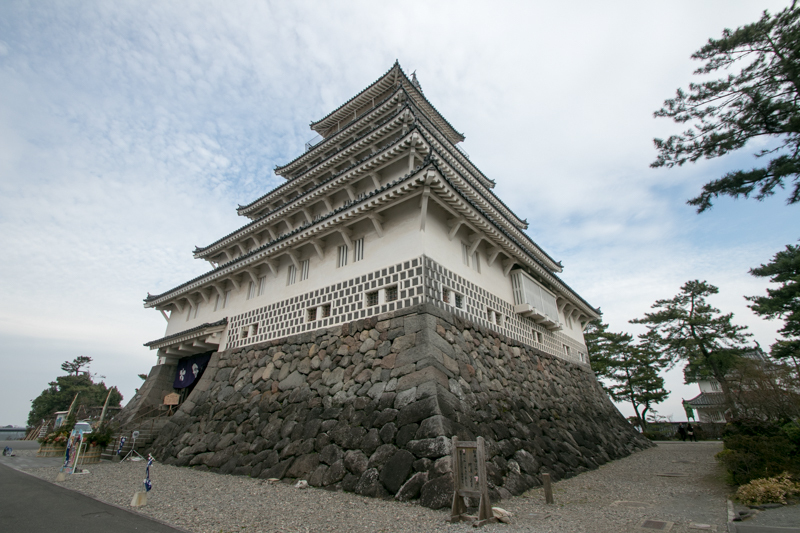 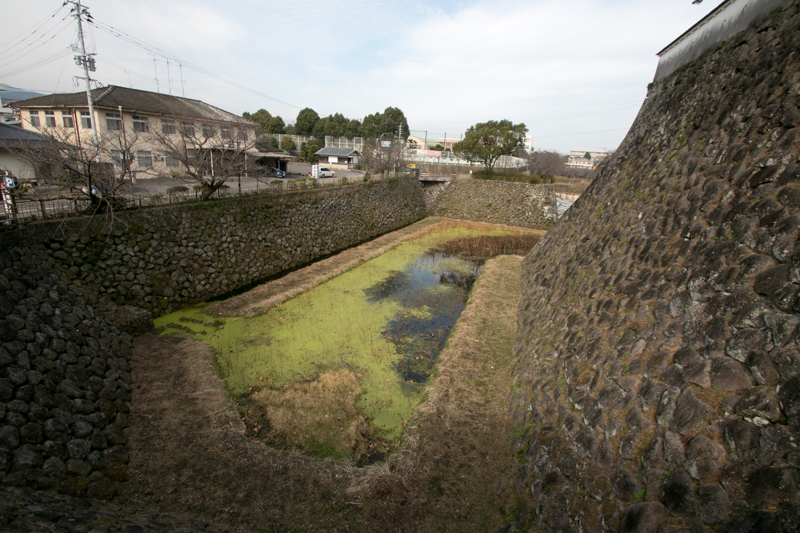 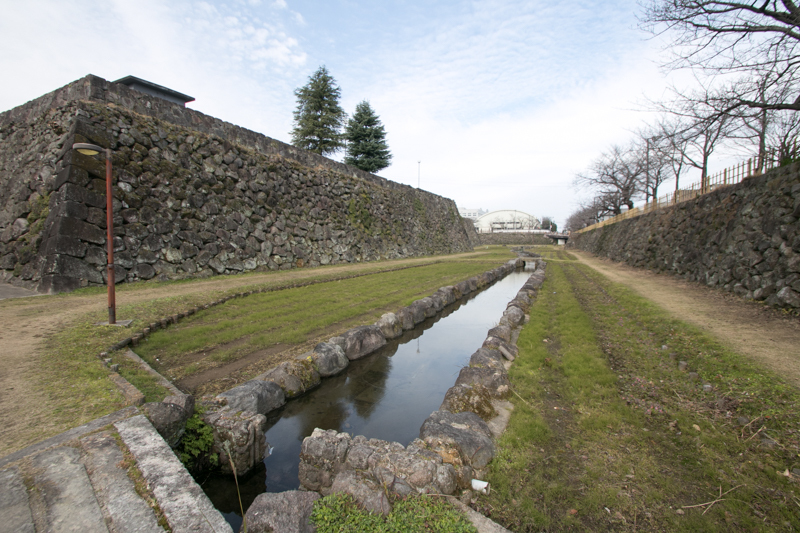 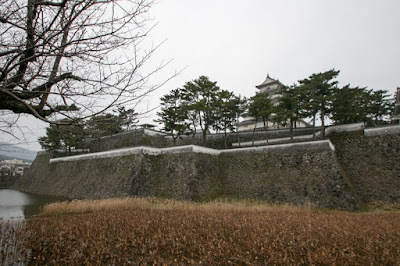 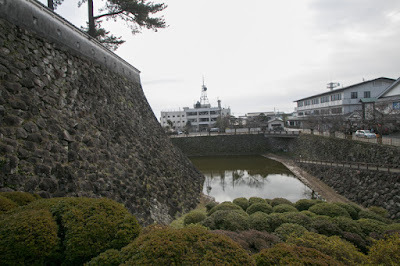 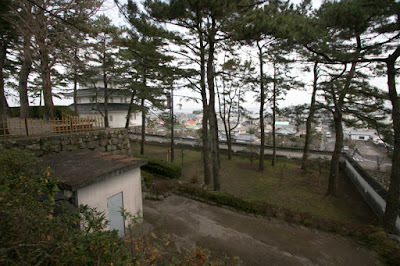 Shimabara castle is built utilizing small hill at the middle of slope separated by two rivers. 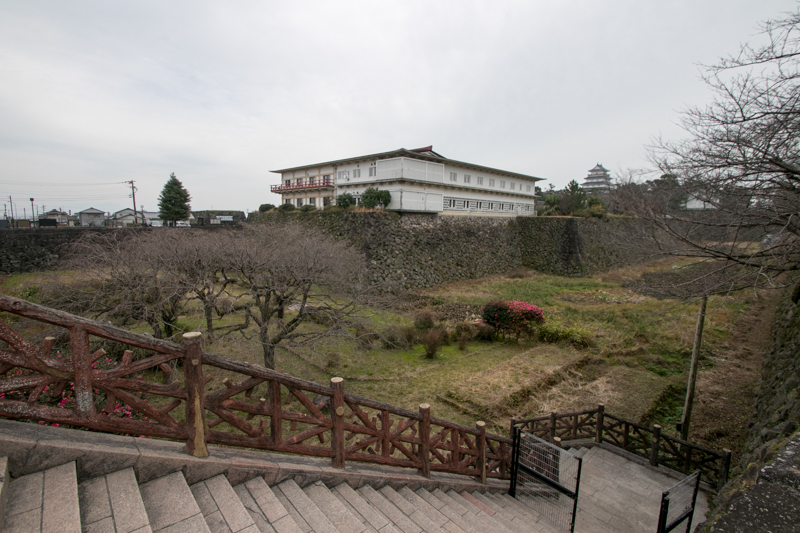 The plan of the castle is a simple one, consist of 200 meter long and 150 meter wide central area and 150 meter square shaped secondary area placed in line and outer area surrounding these core areas. 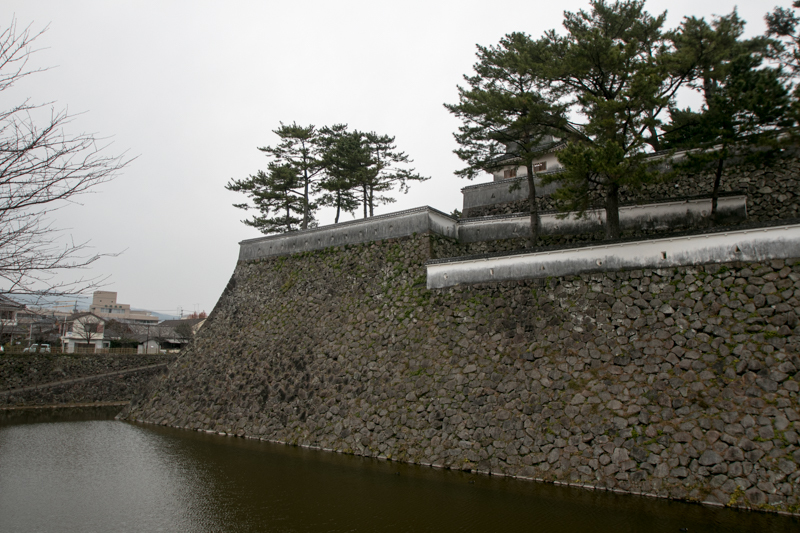 But in spite of its limited size and simple plan, it was quite secure fortress although it was built at peace time. 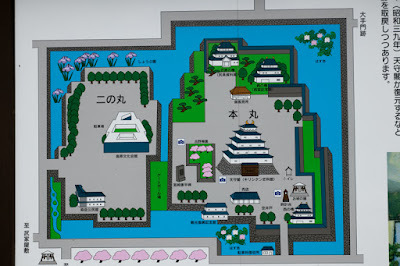 Originally central area was only connected to secondary area and secondary area was also tied with outer area by only one bridge. 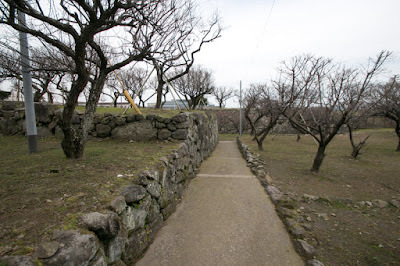 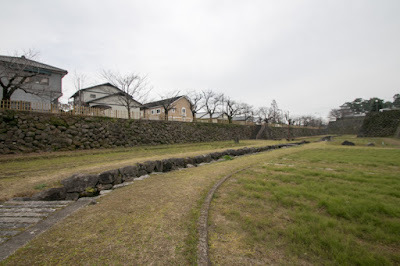 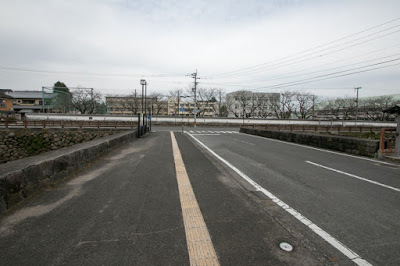 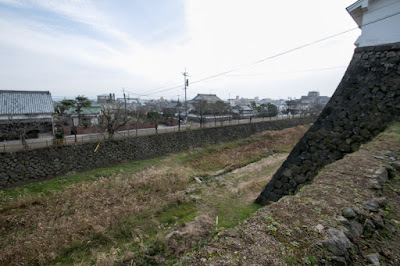 Especially the bridge connecting central area and secondary area was not a clay bridge but wooden bridge, thus once this bridge was broken central area became a totally isolated place. 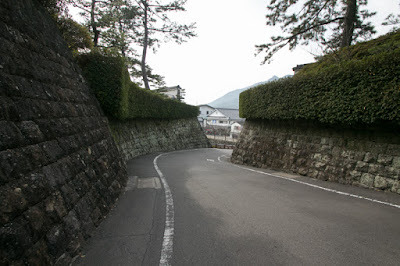 Furthermore, inside of both area was complexly separated by stone walls using the shape of original terrain, and it enables longer resistance against attackers. 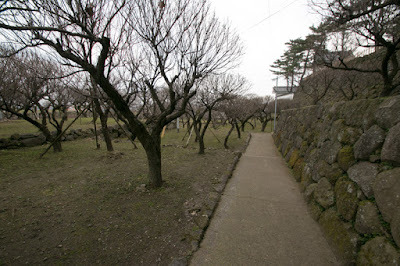 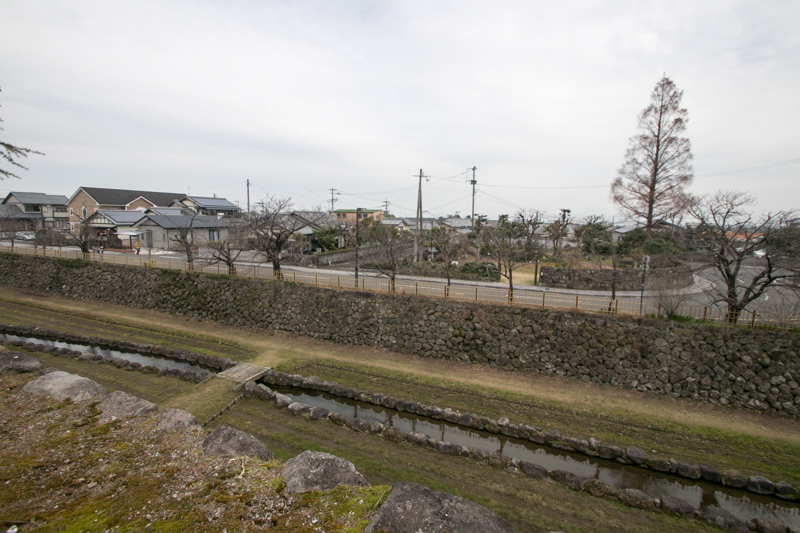 These two areas were separated by tall stone walls and over 20 meter wide water moat. 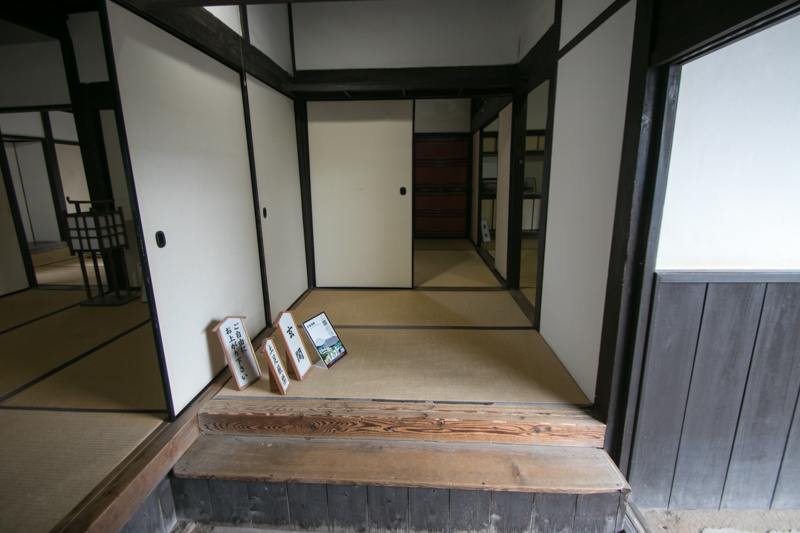 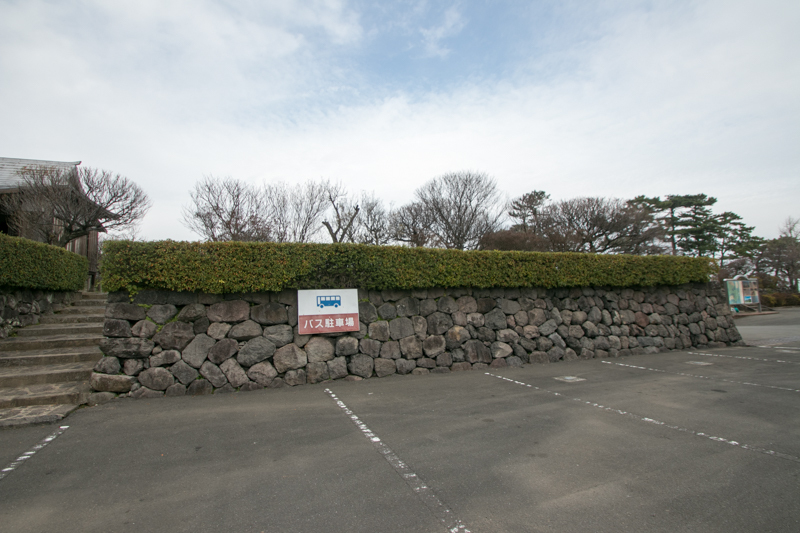 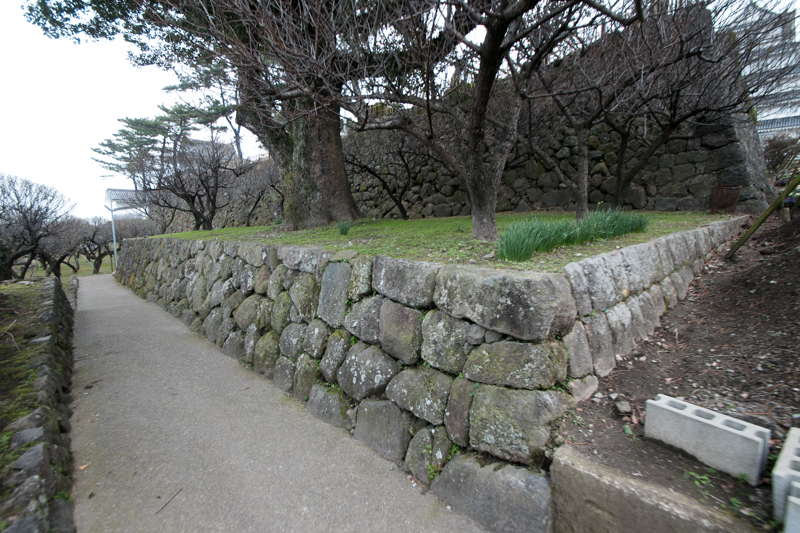 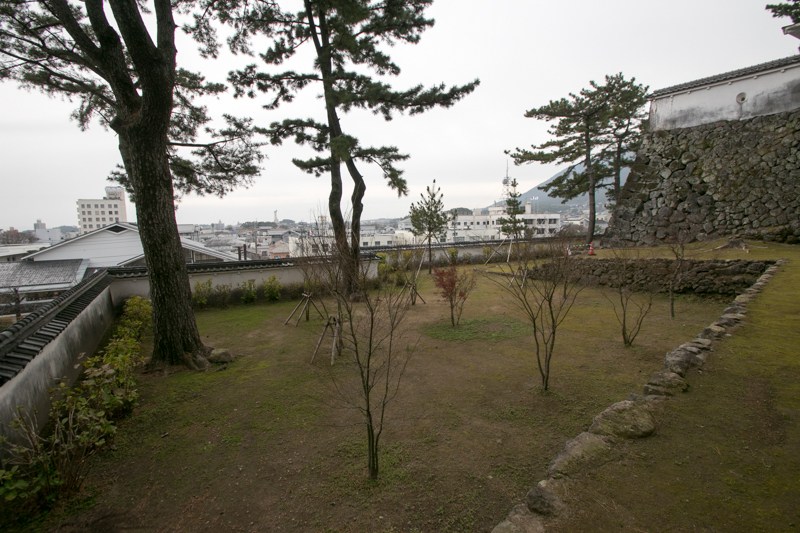 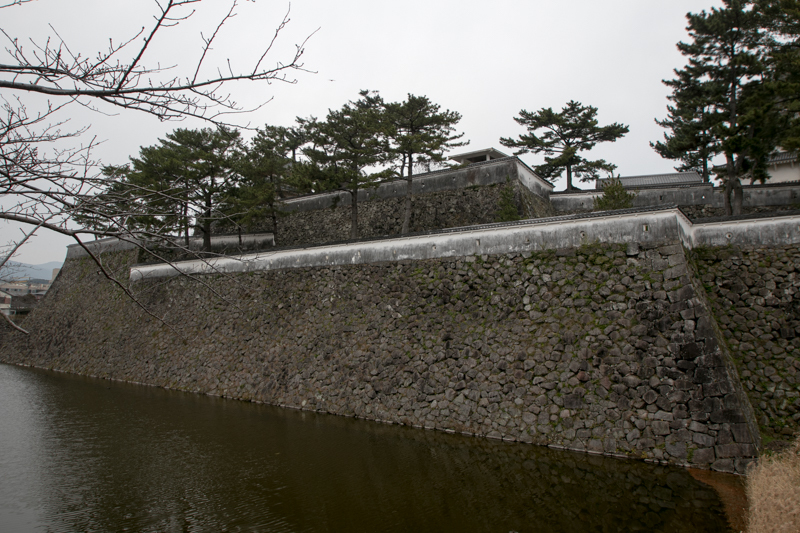 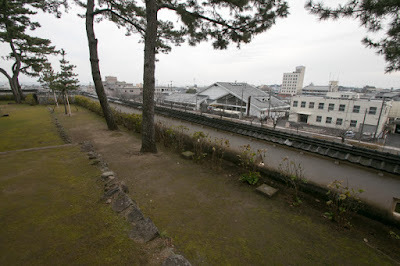 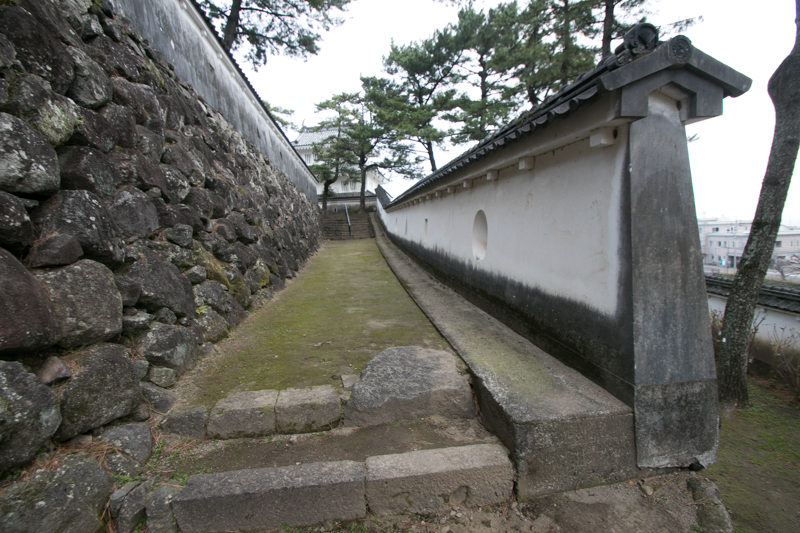 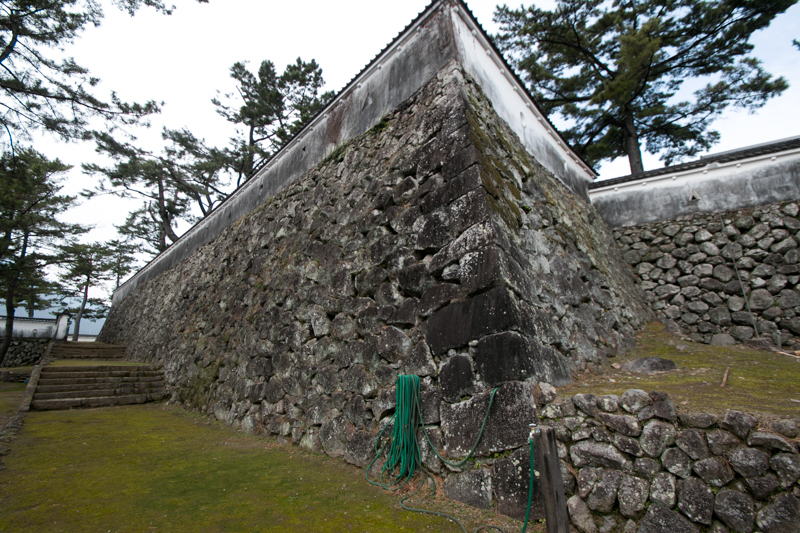 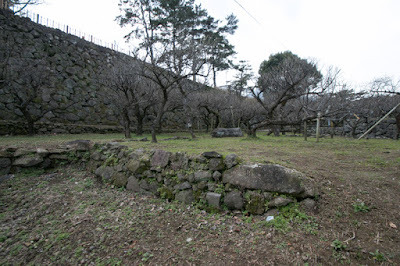 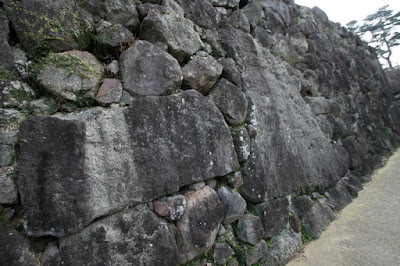 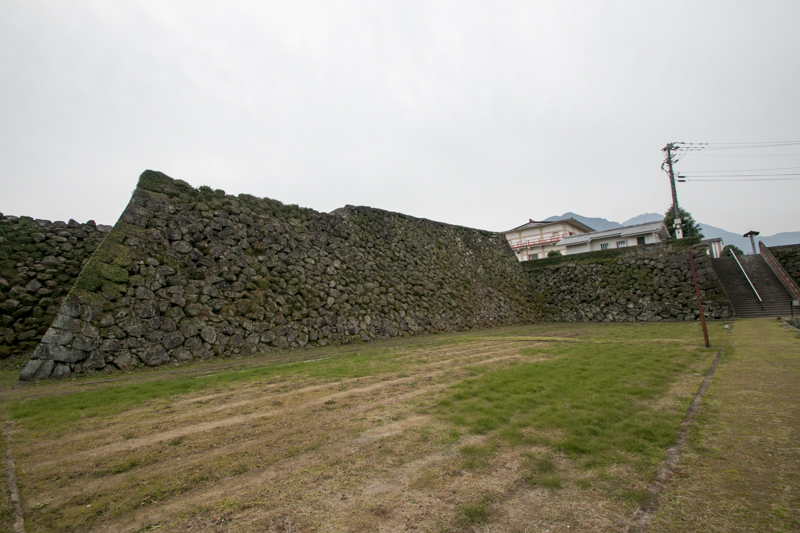 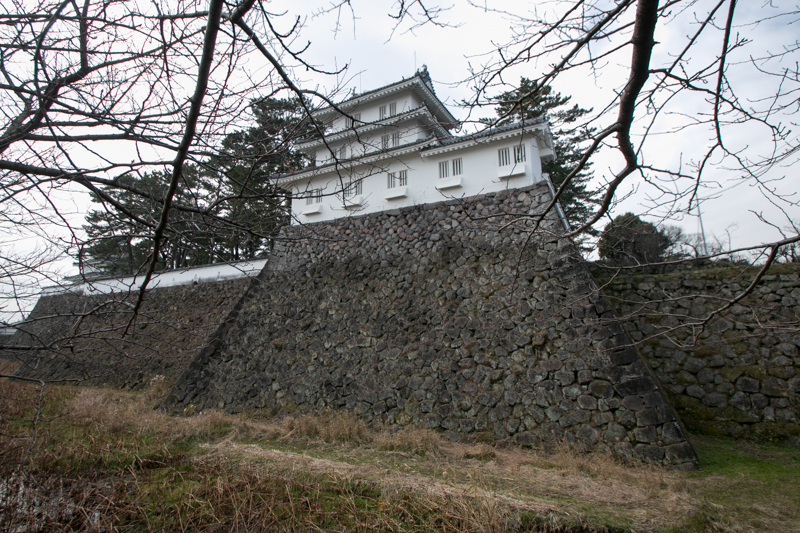 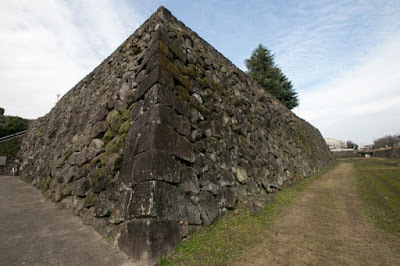 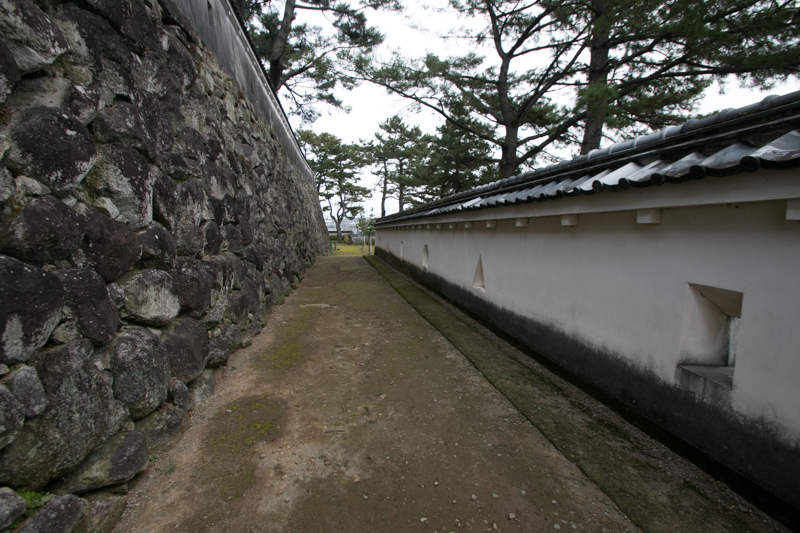 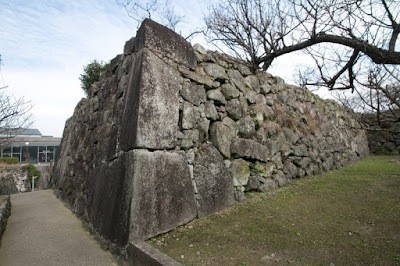 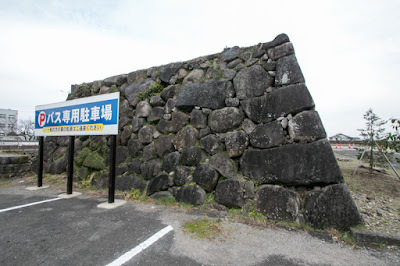 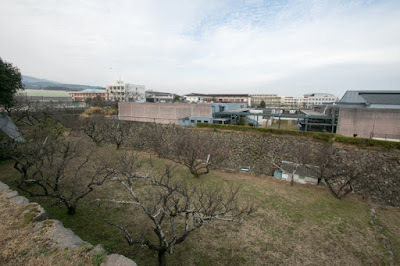 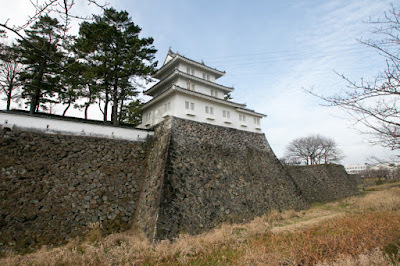 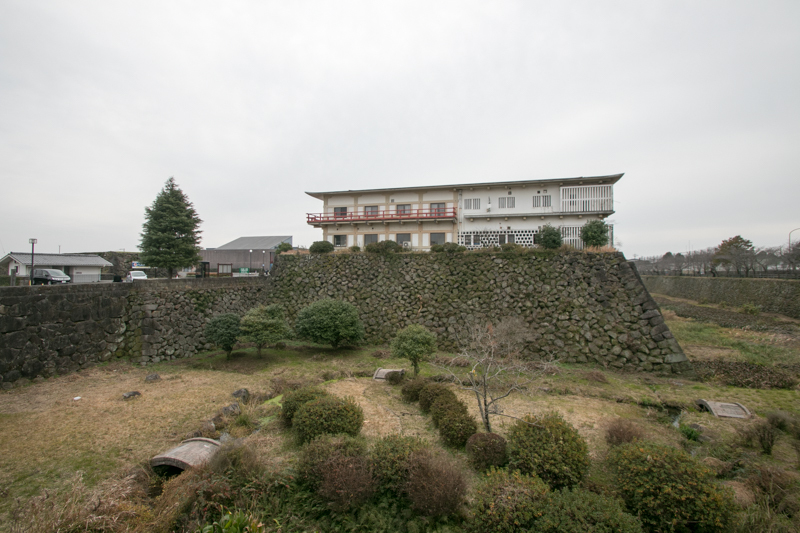 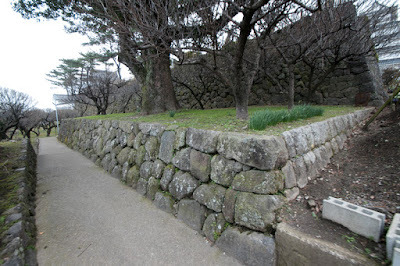 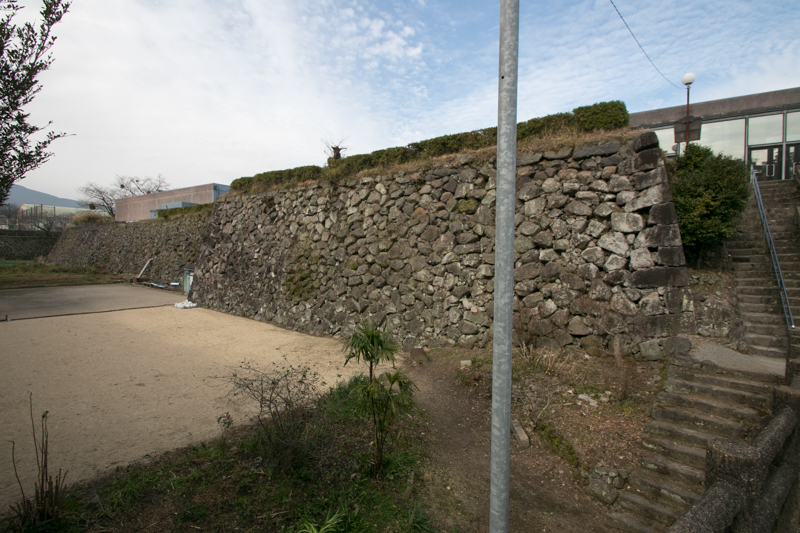 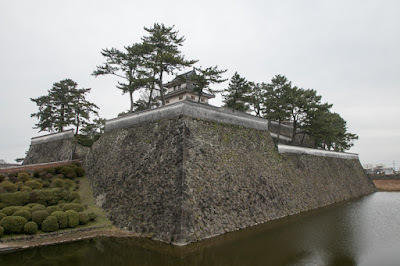 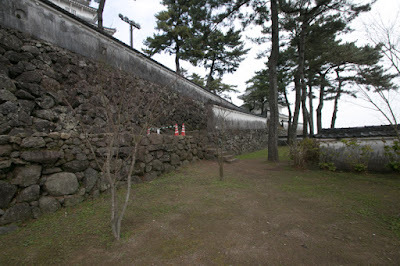 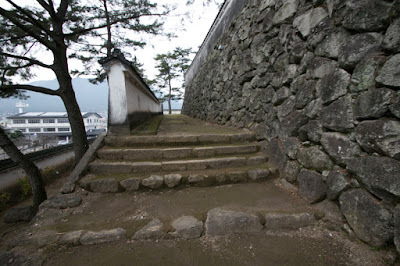 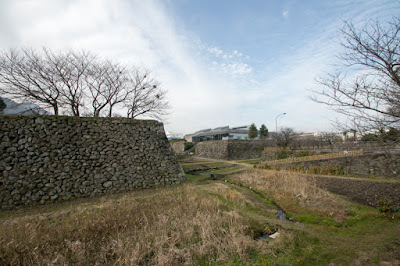 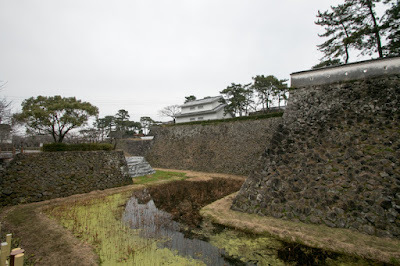 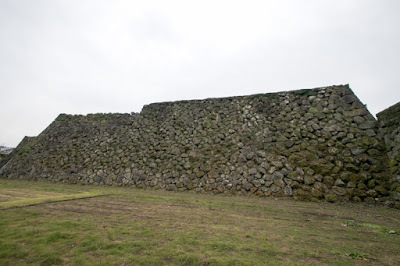 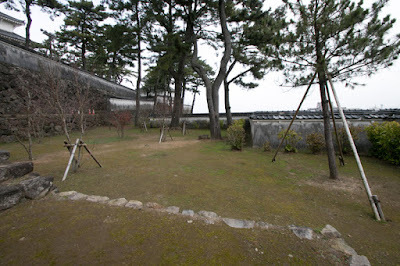 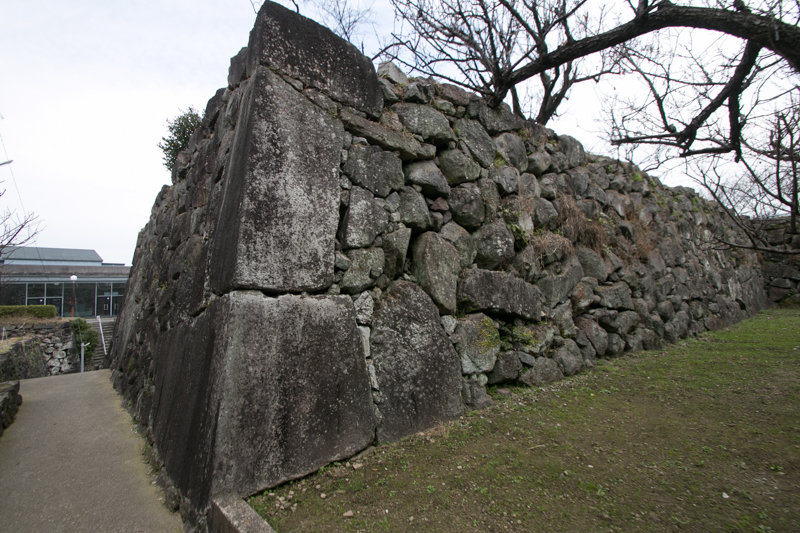 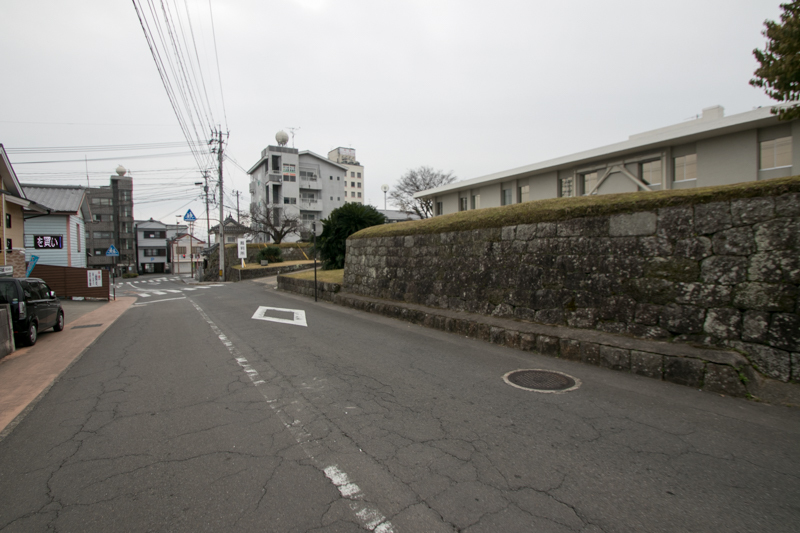 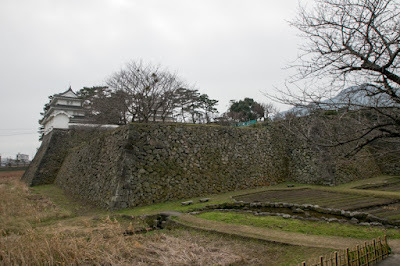 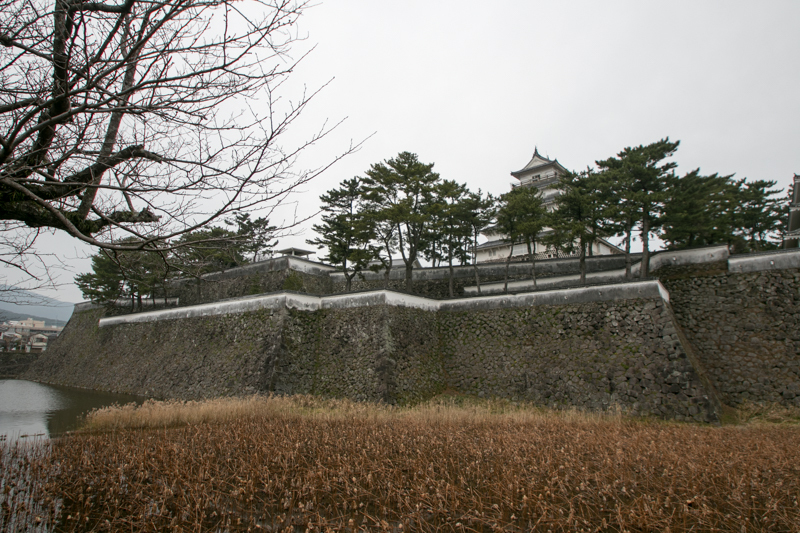 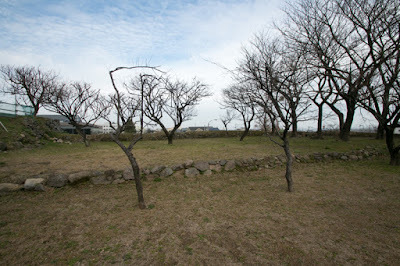 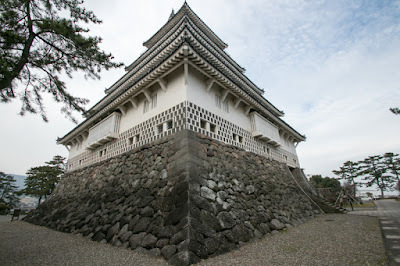 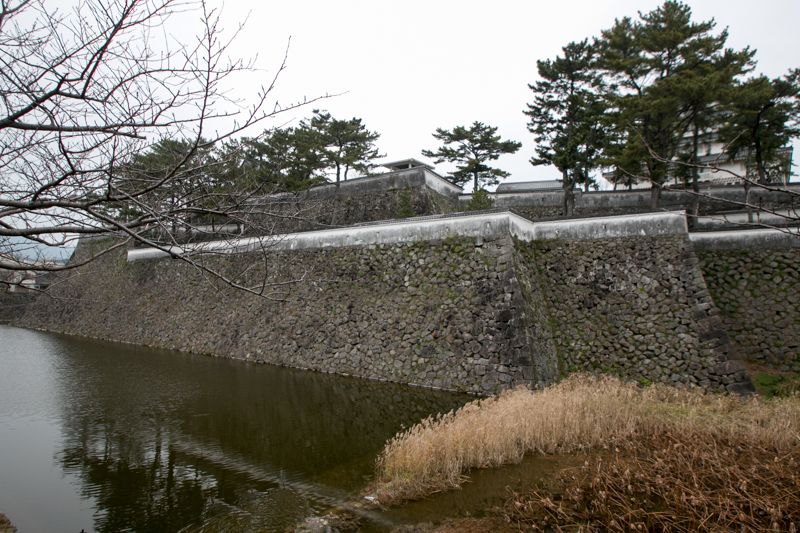 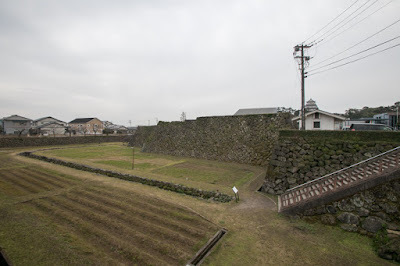 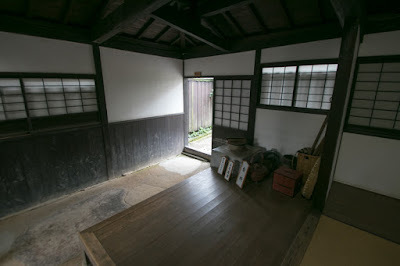 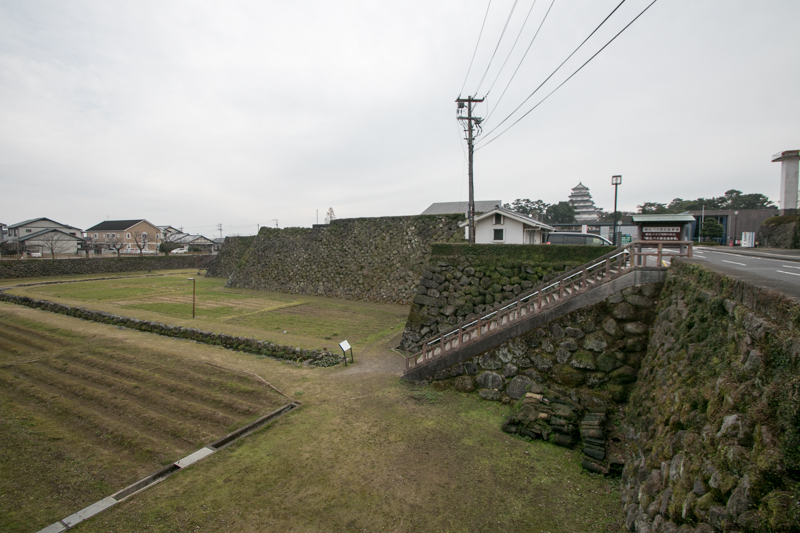 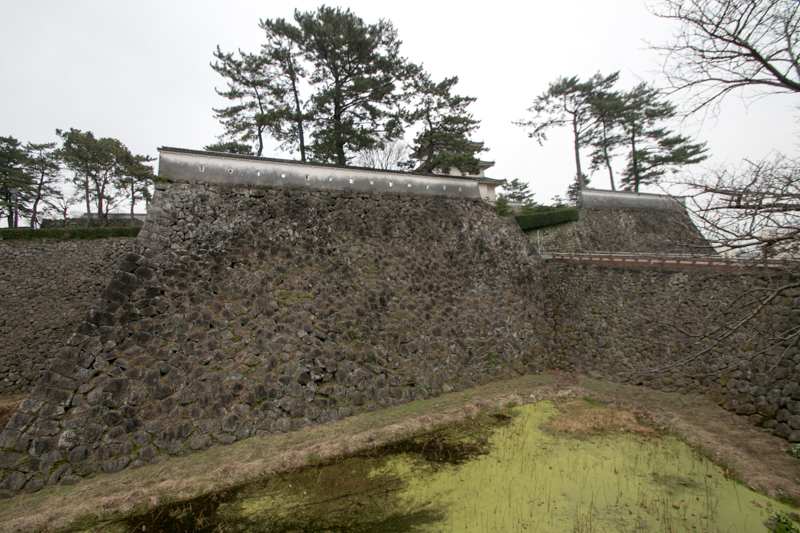 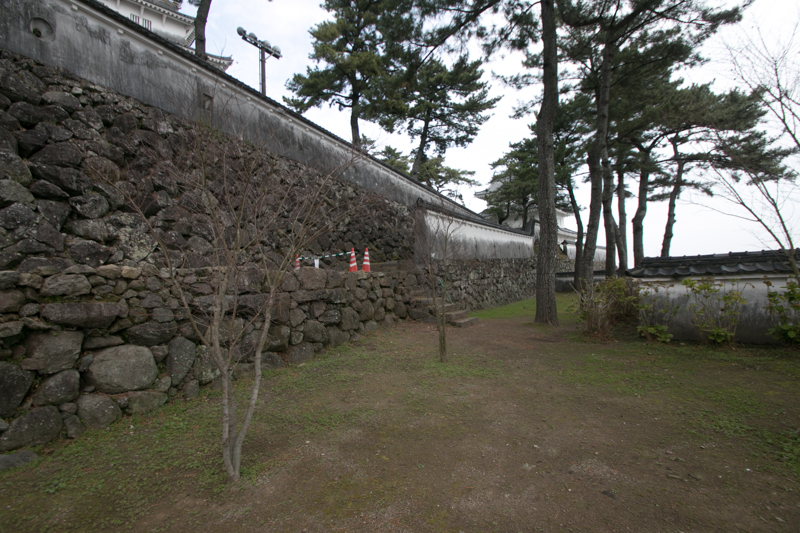 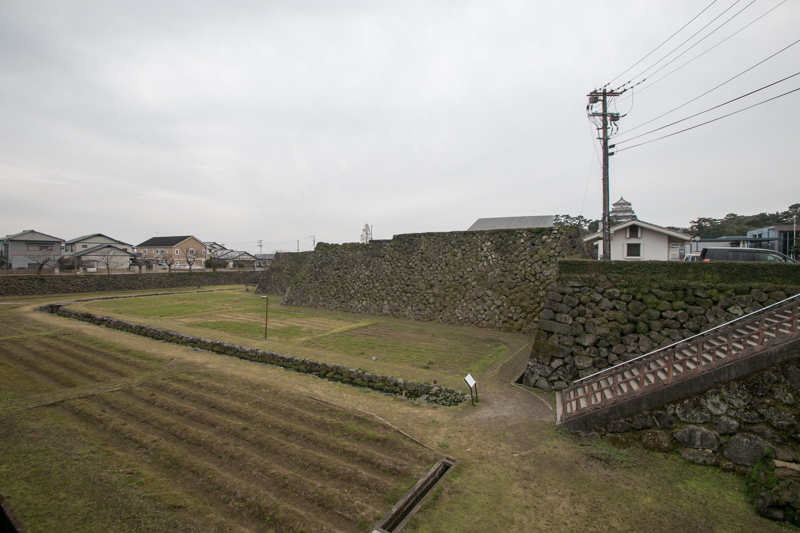 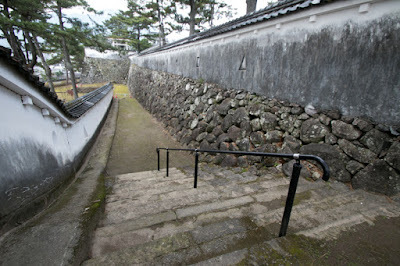 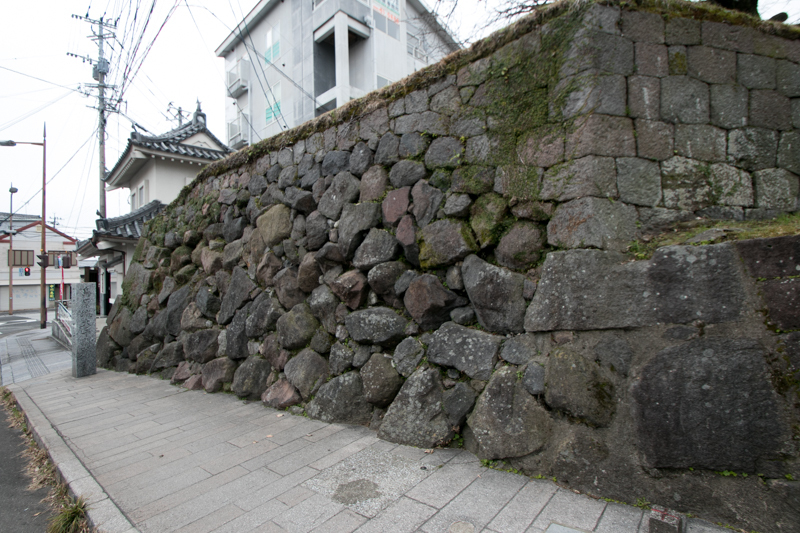 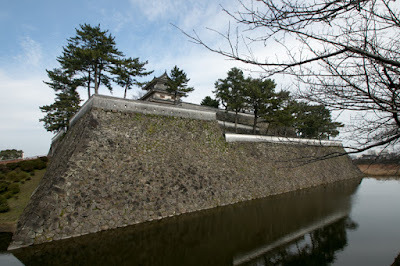 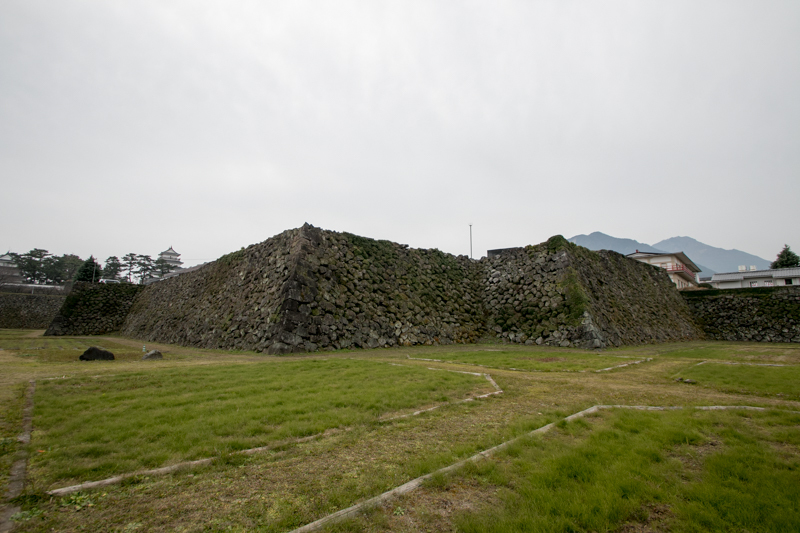 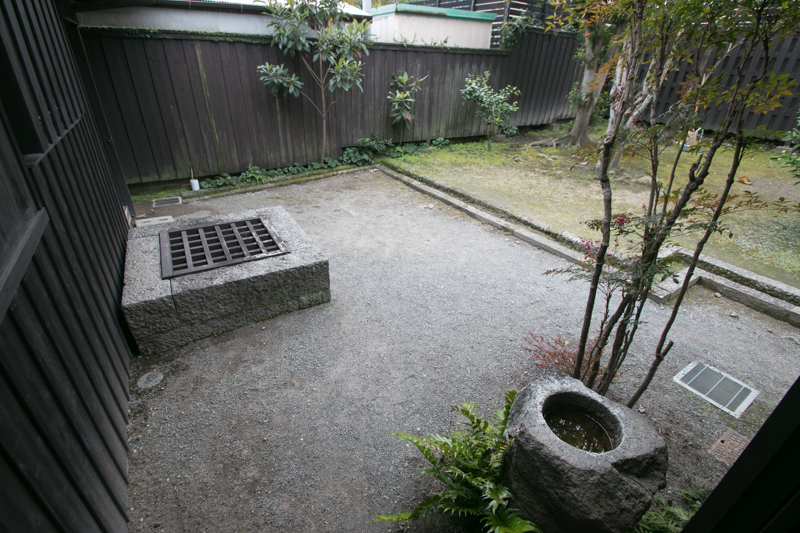 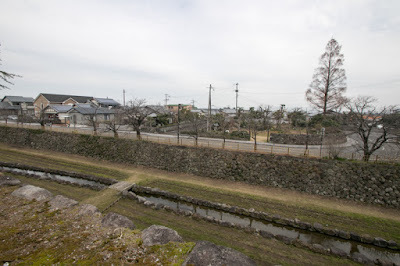 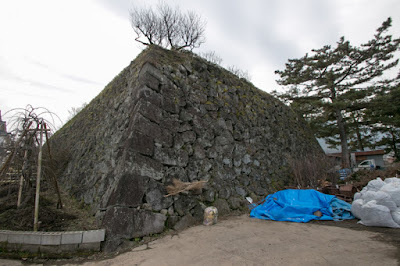 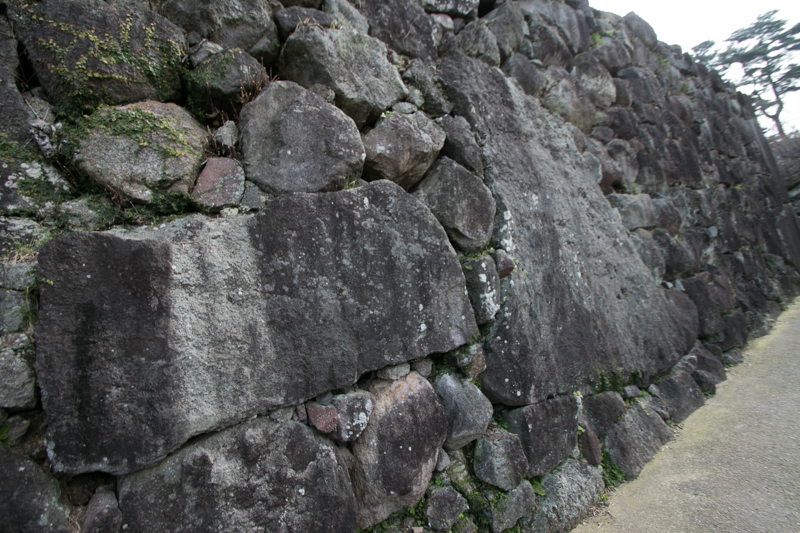 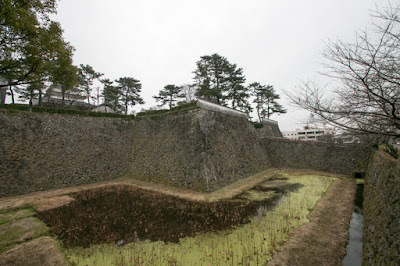 As over all shape of the castle is a simple rectangular, then to erase dead stone walls are intentionally folded, especially at southeastern corner of central area. 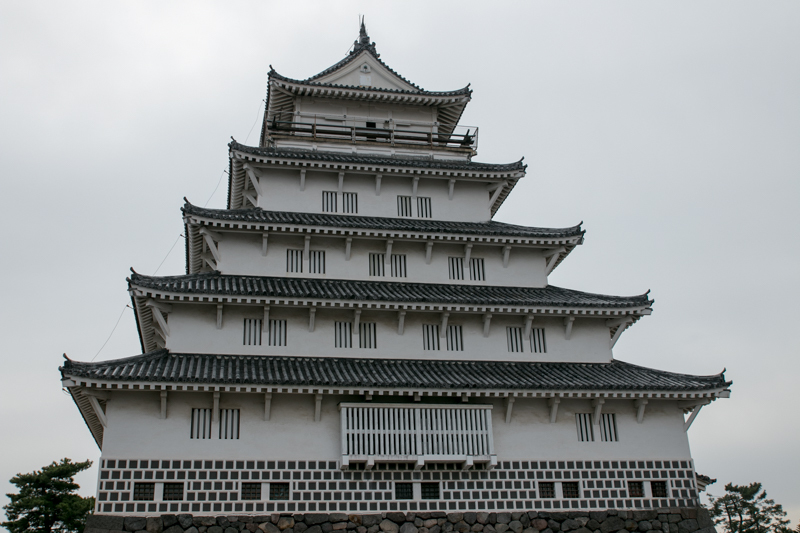 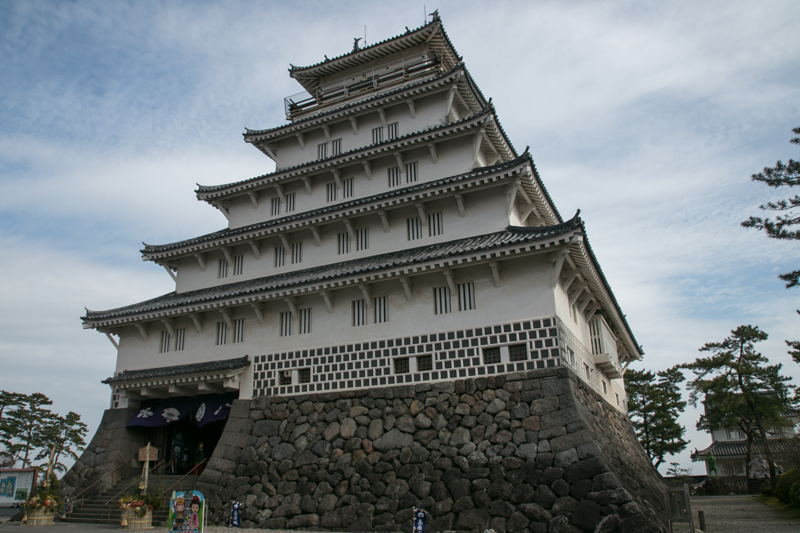 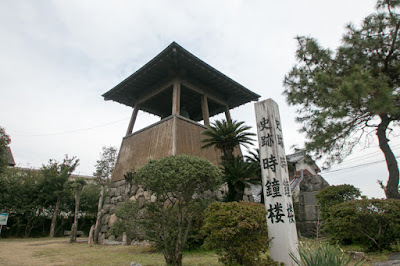 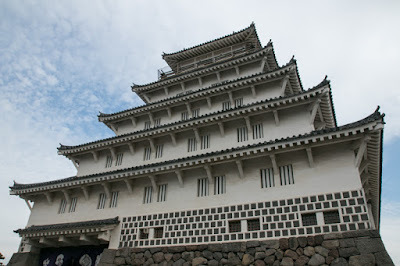 At the center of central area, a five story main tower of Soto-gata style (simple tower style without decorating roof or window) which was the newest style was built, and three story turrets guarded important corner of the castle. 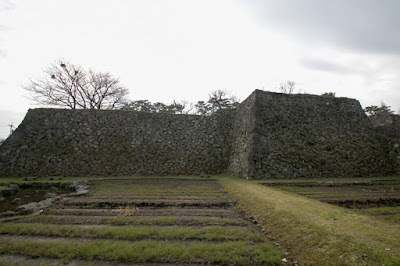 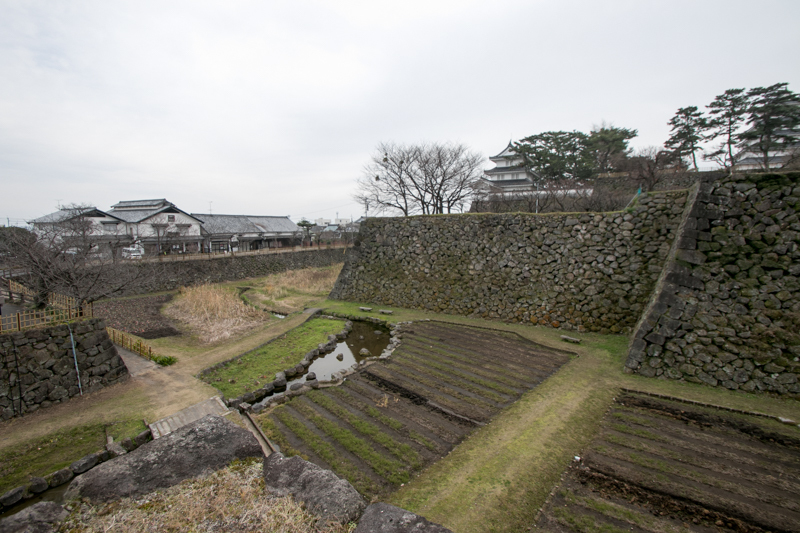 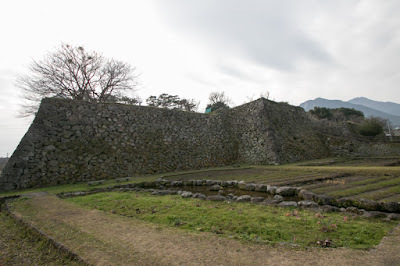 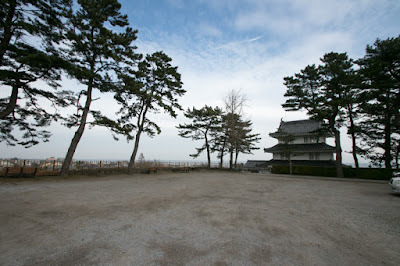 Shimabara domain was a small one of 40,000 Koku (unit of rice harvest), but Shimabara castle was equivalent to the one of over 100,000 Koku lord. 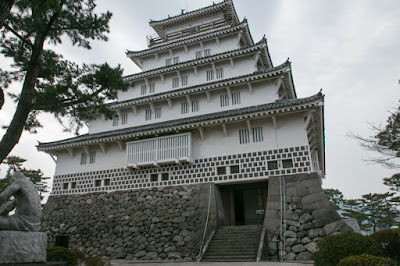 But expenditure to build such magnificent castle and other construction duty was totally funded by strict collection of higher tax from residents. 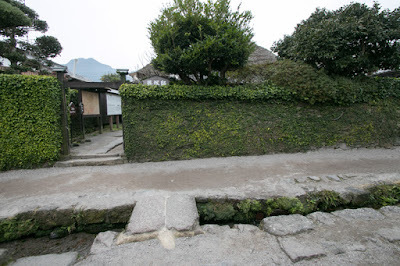 In addition to this, Shigemasa was blamed by Edo Shogunate for insufficient limiation of Christian, and strengthened the suppression to Christians. 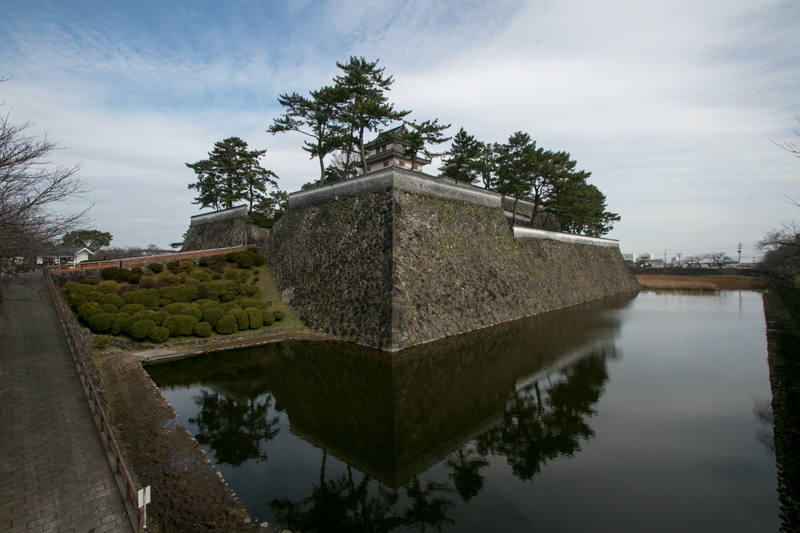 Furthermore, to win the favor of Shogunate, Shigemasa planned an naval excursion to Phillipines and collected another taxes for expenditute. 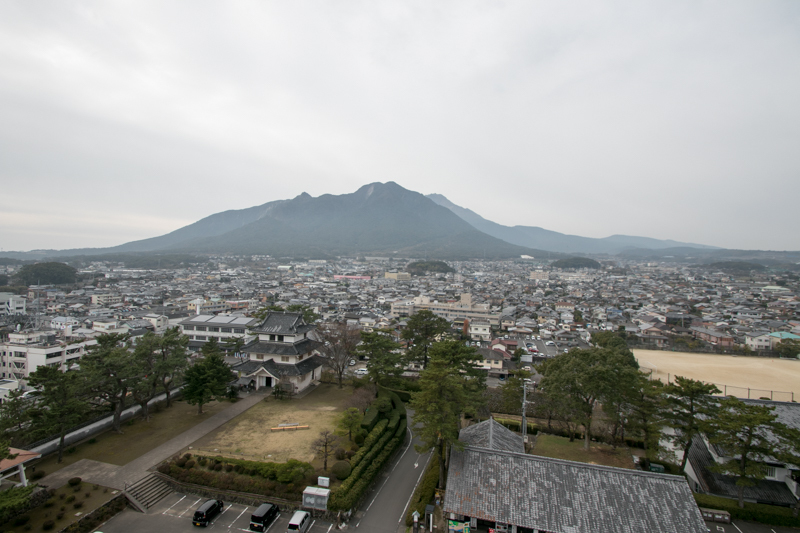 From the view of resident, in front of the volcano, Shimabara castle seemed as if it was “Evil castle at Death mountain”, and Shigemasa was actually abused by missionaries stayed at Nagasaki town as devil. 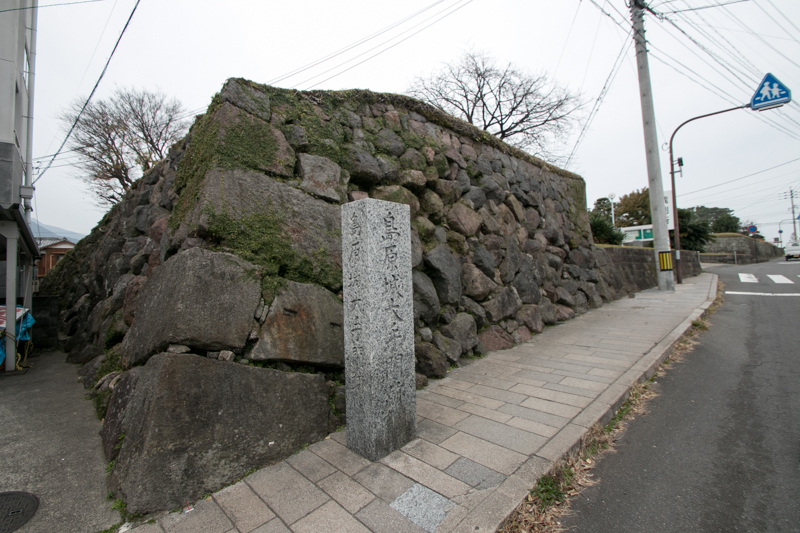 In 1630, Shigemasa died in ill and his son Katsuie Matsukura (1597-1638) succeeded leader position. Katsuie further strengthened tax collection and suppression to Christians, and probably derived from his character, cruelly killed many people who did not pay tax or leave Christianity. 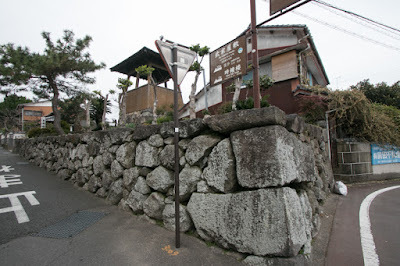 At the same time, opposite of straight, Terasawa clan also tormented residents by higher tax. 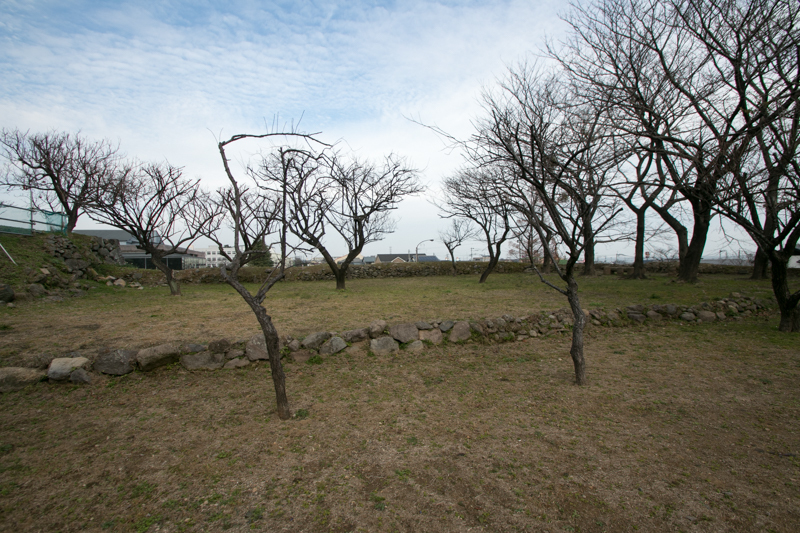 At last, in October 1637, representative of pheasants of two areas met at an island at the middle of two areas and agreed to raise army. 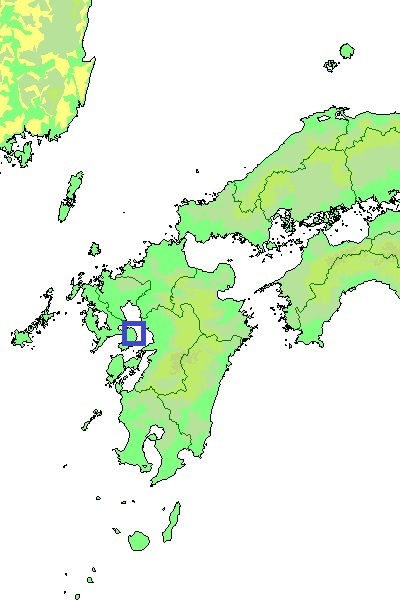 Just after that, people southern area upraised at south part of Shimabara peninsula. 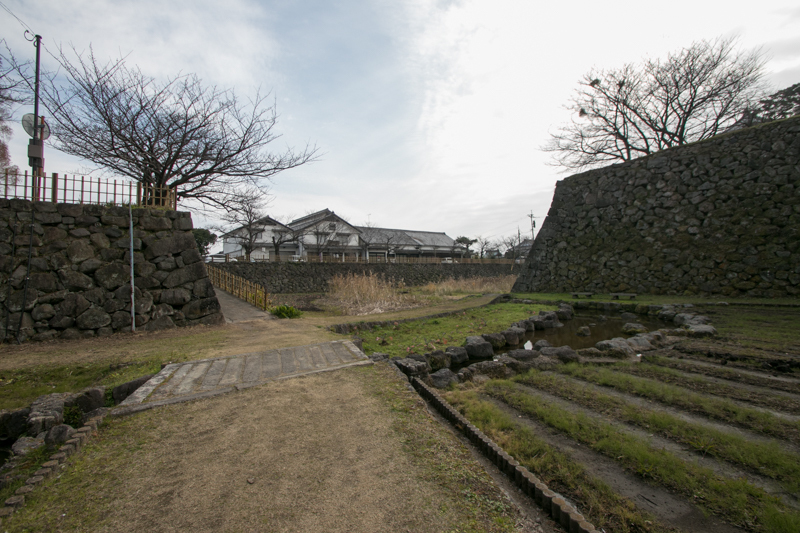 This was the start of "Shimabara no Ran", the largest rebellion of pheasants in the history of Japan. 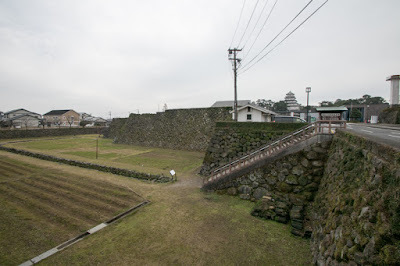 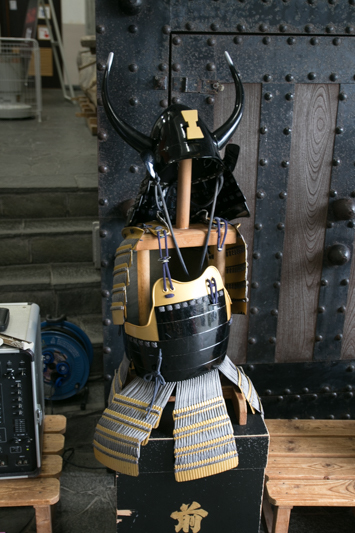 Rebellion army increased to over 20,000 people attacked Shimabara castle, but they could not fall secure Shimabara castle and only deprived weapon and supplies from castle town. 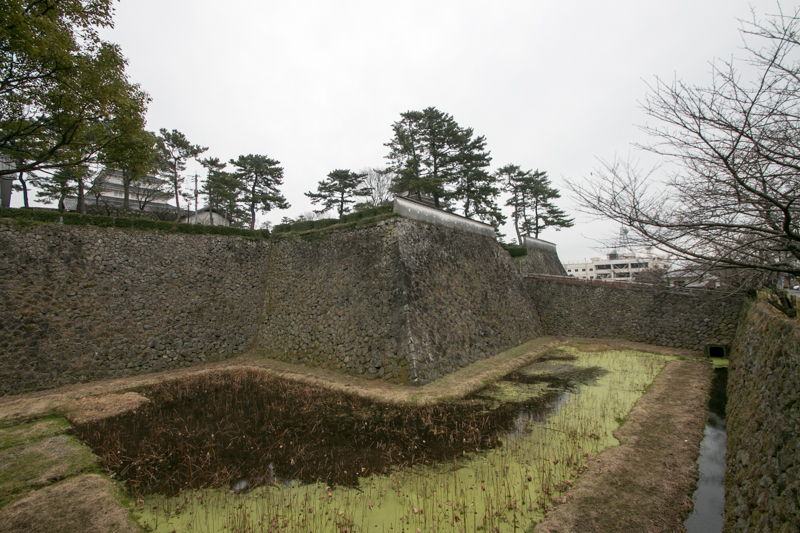 At the same time people of Amakusa island also revolted, but this troop also could not fall Tomioka castle then situation became deadlock. 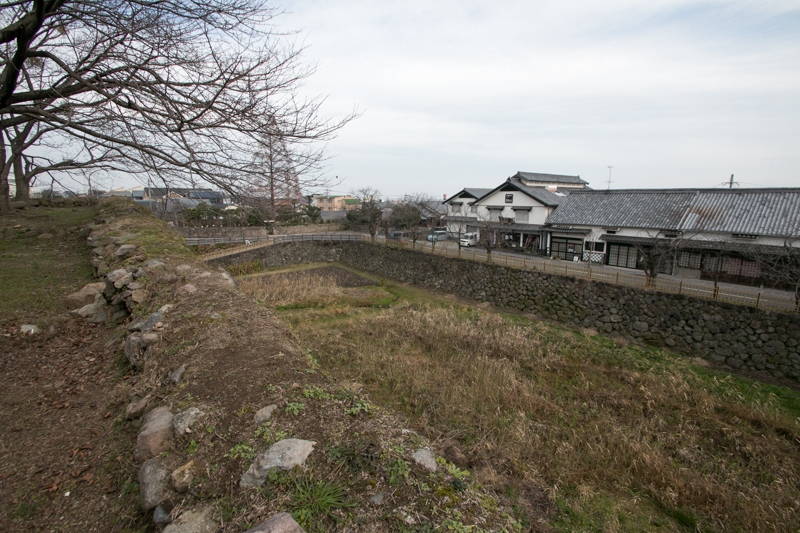 Hearing the arrival of reinforcement by Shogunate, these two group jointed and besieged at the ruin of abolished Hara castle. 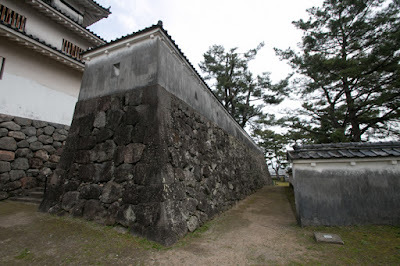 Katsuie once survived at this time, and after 3 month siege Hara castle fell then rebellion had finished. But after the settlement, Katsuie was blamed as the cause for rebellion. 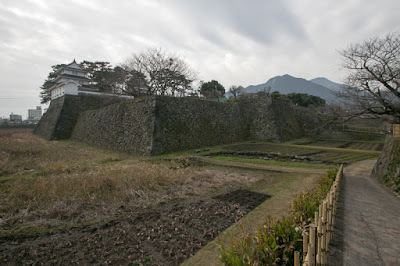 Under the status system rebellion of pheasants was unforgivable fact for Shogunate, but Shogunate also had the idea of agricultural fundamentalism and excessive exploitation was also a serious crime. Furthermore this rebellion seriously hurt the authority of Shogunate, then finally Katsuie was confiscated his territory and executed as a prisoner, not by honorable suicide usually applied to the lord. 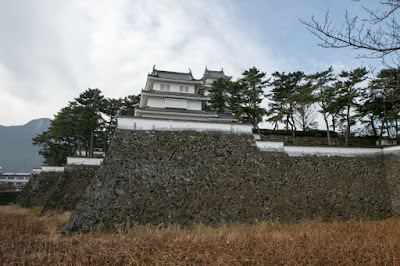 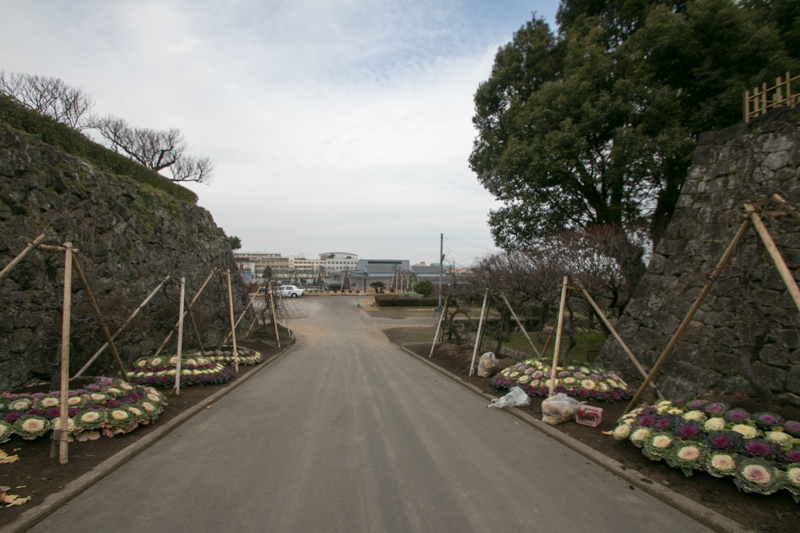 Shimabara castle actually worked but it was a kind of self fulfilling prophecy, and there might be another better way. 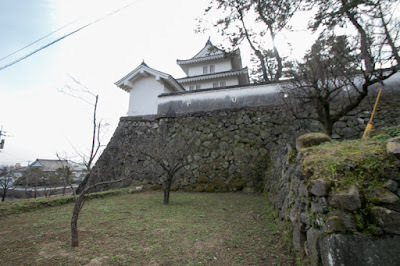 After Matsukura clan, Koriki clan, Matsudaira clan or Toda clan which were relative or hereditary retainer of Edo Shogunate became the lord of Shimabara castle. 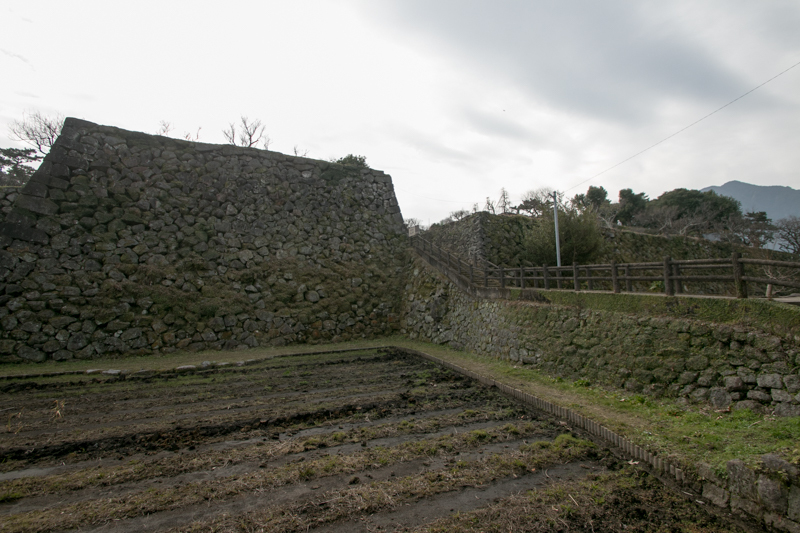 To revive the peninsula extremely devastated in the rebellion, each lords invited immigrants from many area and promoted agriculture. 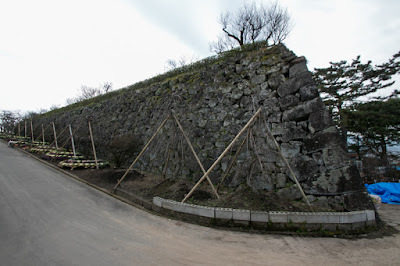 In the latter half of Edo era the situation became stabilized, but in 1792 Mayuyama mountain at the above of Shimabara castle collapsed and because of debris flow Shimabara town suffered severe damage again. 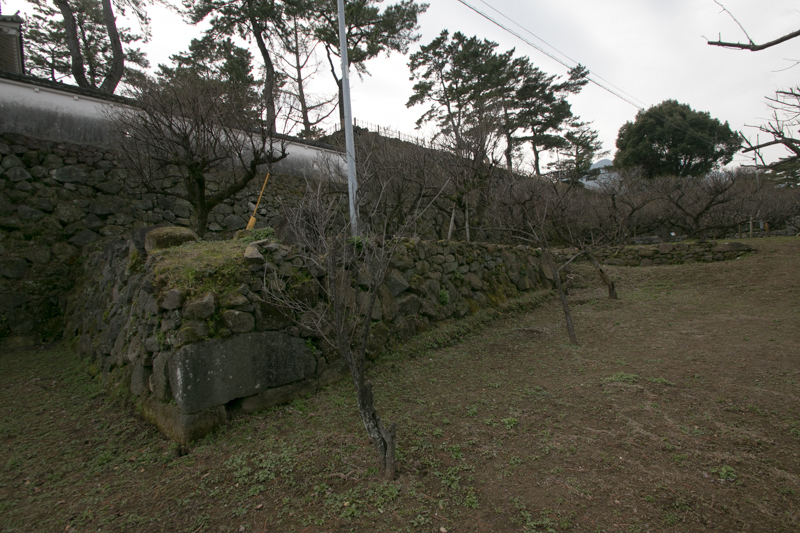 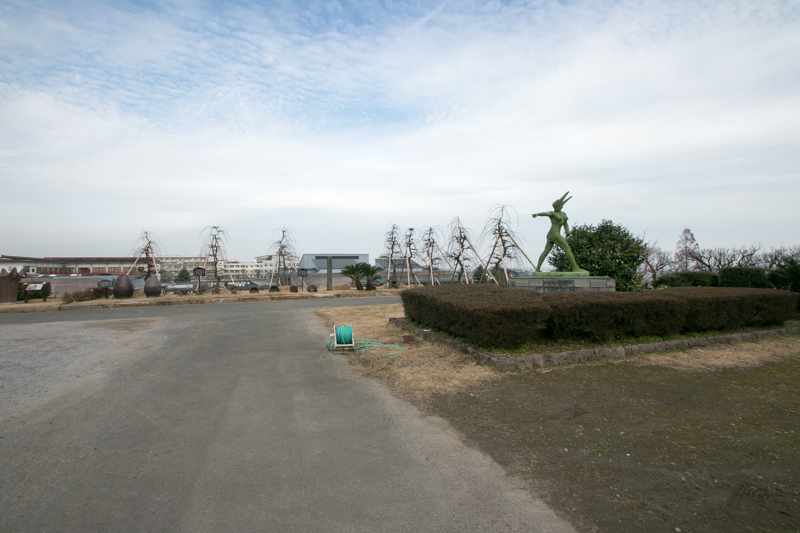 Because of recurring natural disaster and severe situation, many lords of Shimabara domain were short-lived. 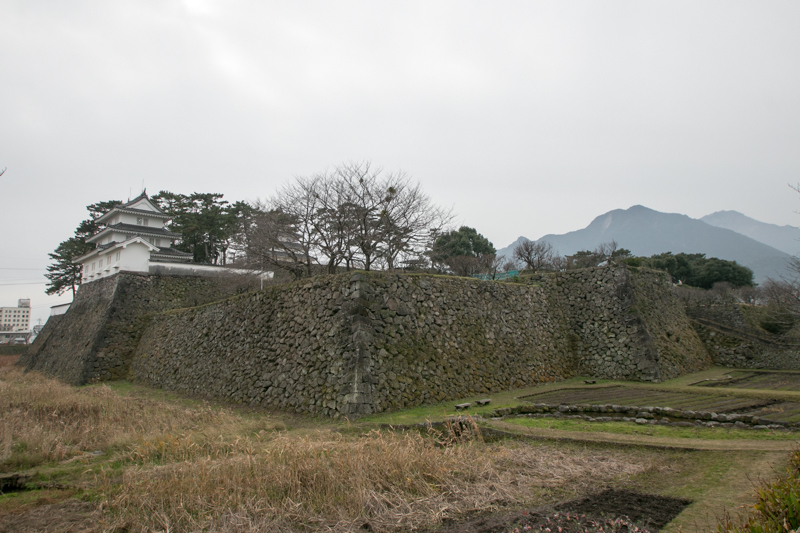 Subsequent to Meiji revolution, Shimabara castle was abolished and all buildings including magnificent main tower was broken. Castle site was used as a ground of school, but after WW2, main tower and several turrets were restored from 1960 to 1980. 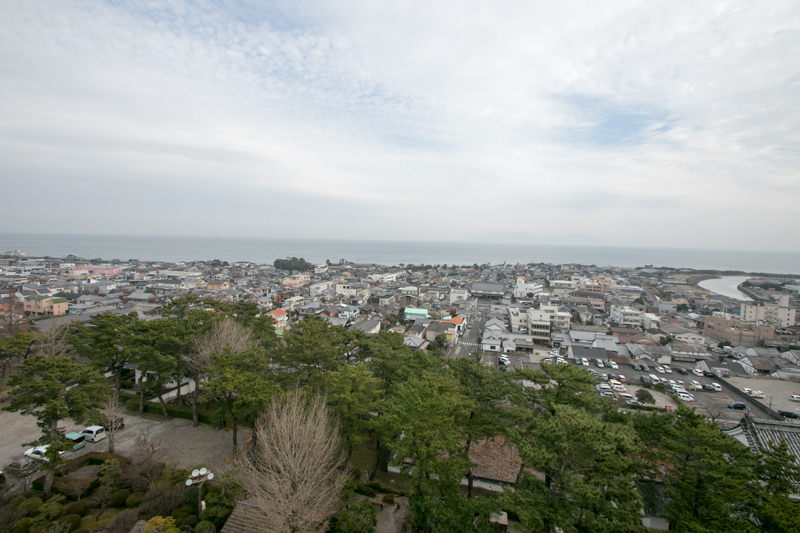 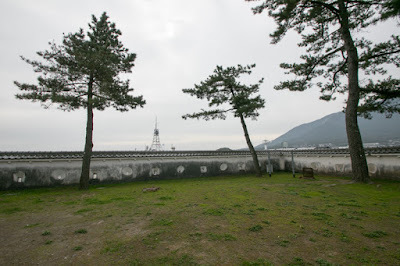 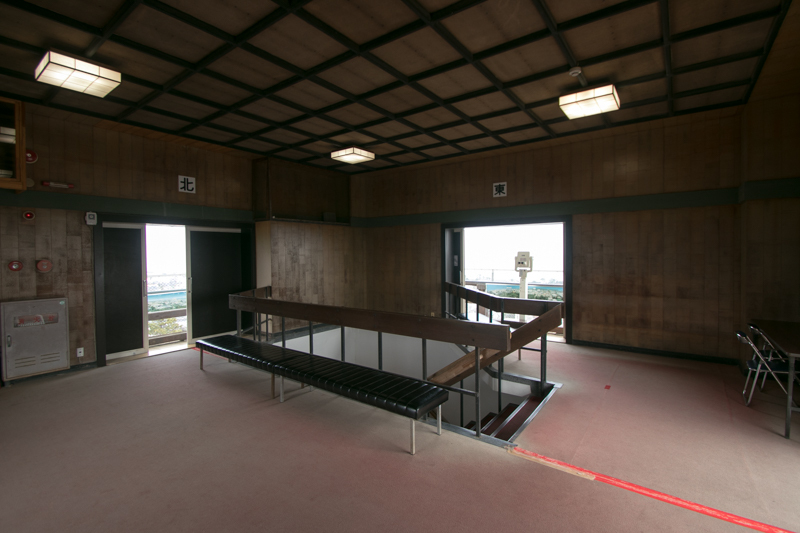 As main tower was the highest building in the area, from the top of main tower beautiful scenery of Unzen Mountain and Ariake sea is clearly seen. Looking at the sheer stone wall and broad moats surrounding forest of buildings, the strong will to shut the castle is clearly seen. 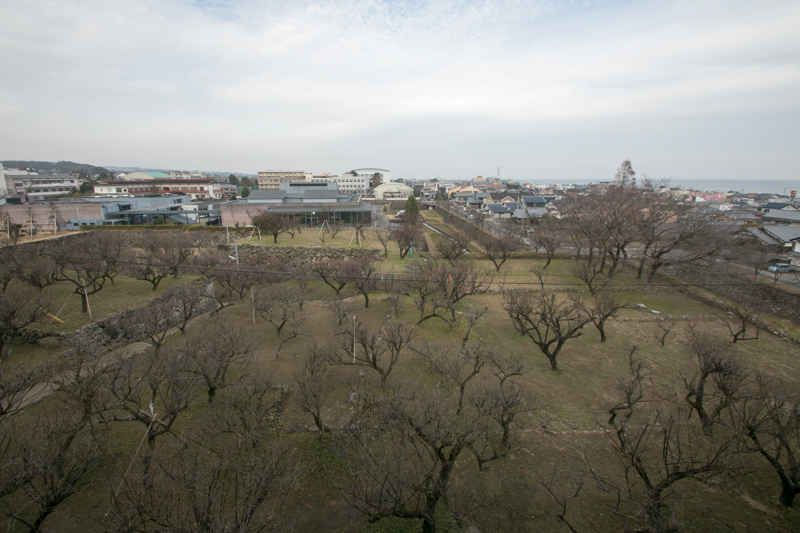 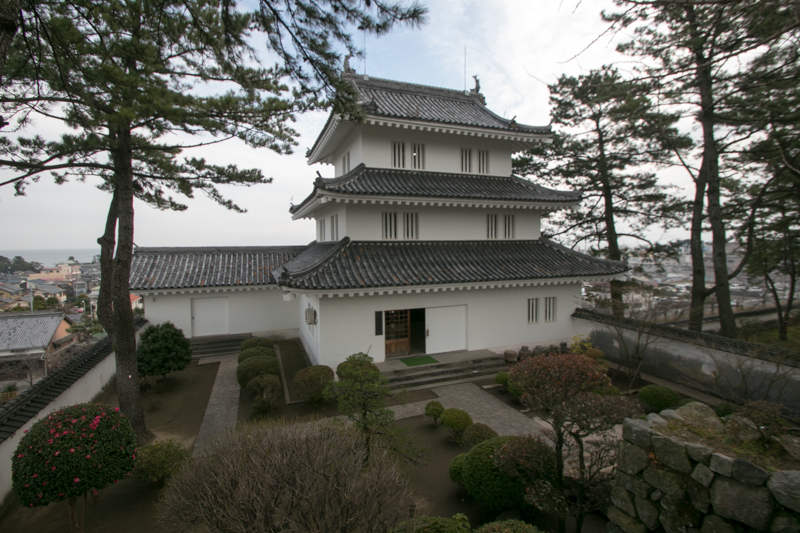 Shimabara castle is a highly completed castle as fortress, but it is quite regrettable that it's completeness was directed to residents of the area, not to other lords. 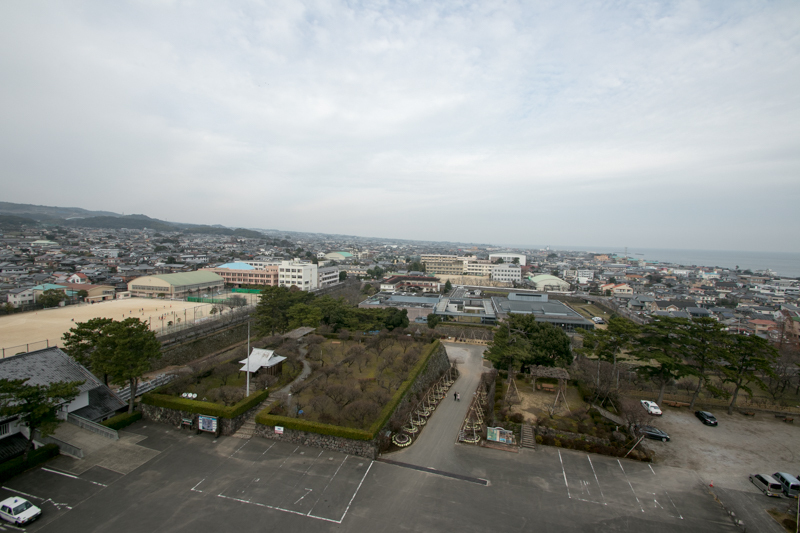 60 minutes drive from Nagasaki Expressway Isahaya interchange. 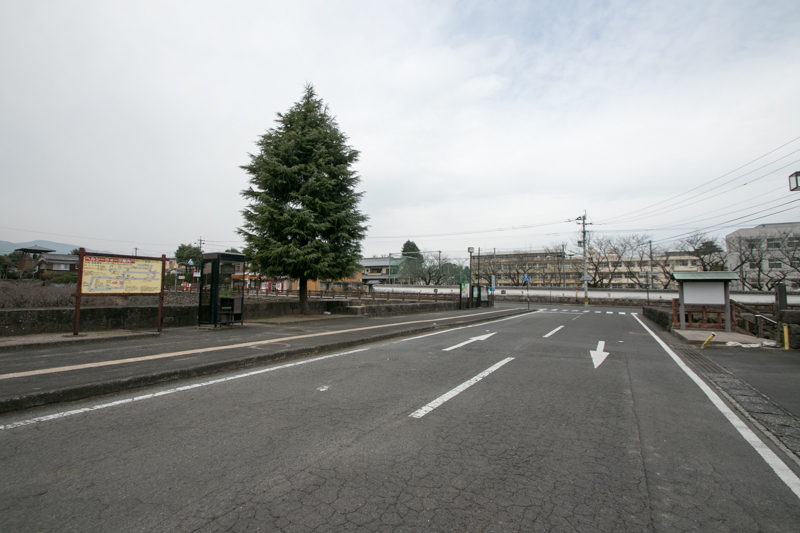 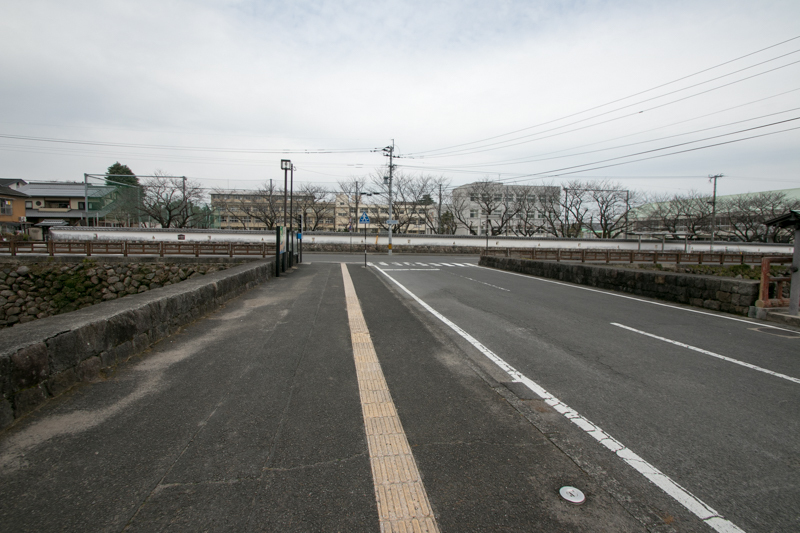 5 minutes walk from Shimabara Tetsudo line Shimabara station but access from JR Kyushu line is not so good.